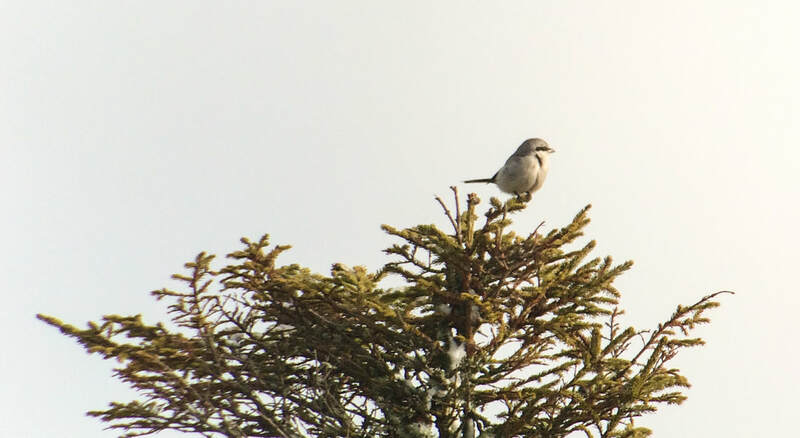 Inverness-shire: Great Grey Shrike on Drumashie Moor near Bunachton from minor road at NH659366 (Jon Clarke). 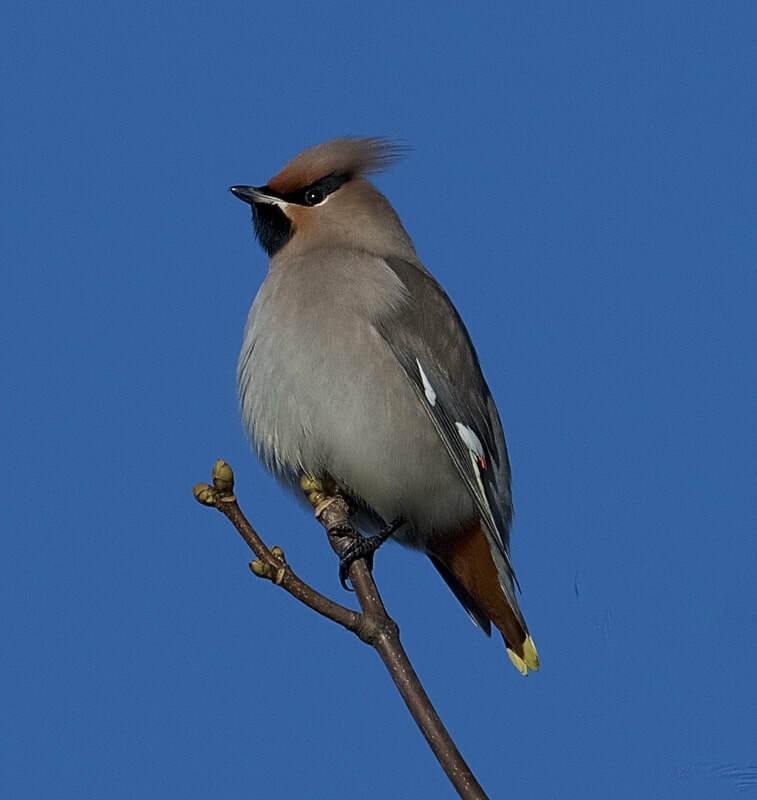 9 Waxwing still around Aldi on Telford Street in Inverness at 1425pm. Also 12 Waxwings at Kessock Avenue, Inverness this afternoon (RBA). Spotted Redshank again at the floods at Easter Dalziel to the east of the Petty railway crossing road (Bob McMillan). 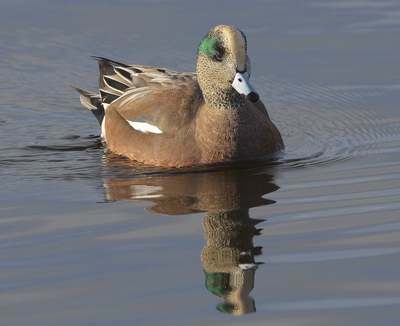 Easter Ross: Drake American Wigeon still at Tain Links this morning (Bob Swann). 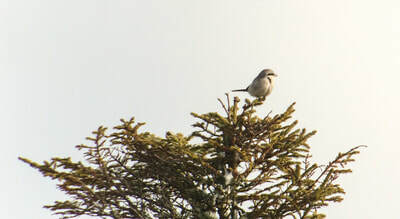 Great Grey Shrike at Drumashie Moor (Jon Clarke). 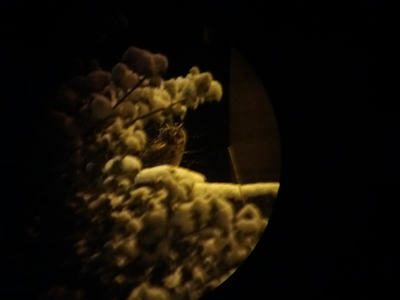 Inverness-shire: At the Aldi in Inverness on Telford Street at 15.00pm, 9 Waxwings on telegraph pole for about 30 minutes before going down to the apple tree next to Aldi car park, watched for an hour (Ian Herd). 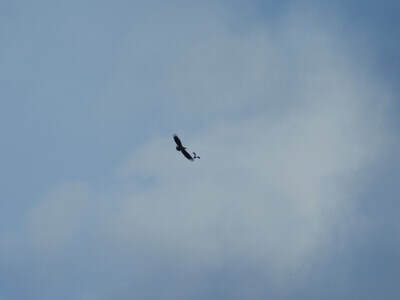 Sutherland: Pale-bellied Brent goose at Embo (Dean MacAskill). 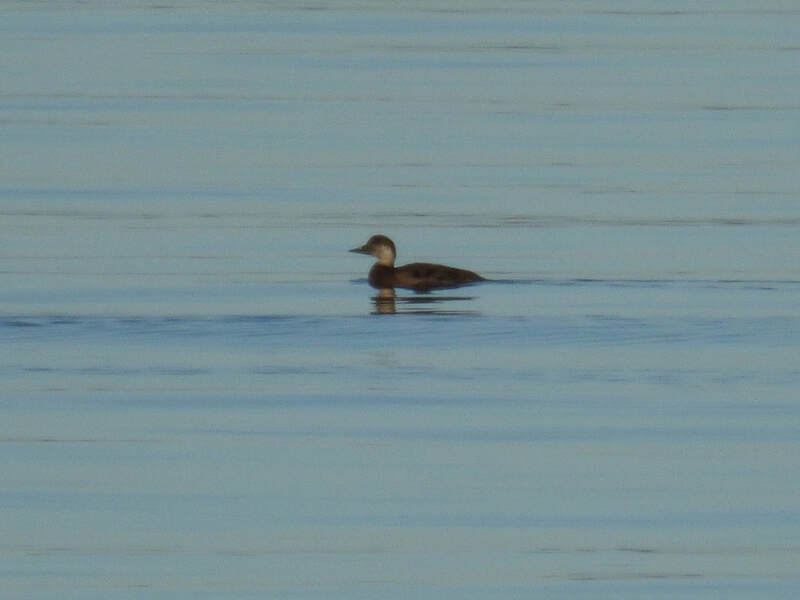 Drake Ring-necked Duck still on Little Loch Shin, Lairg at midday (Mary and Dave Galloway). 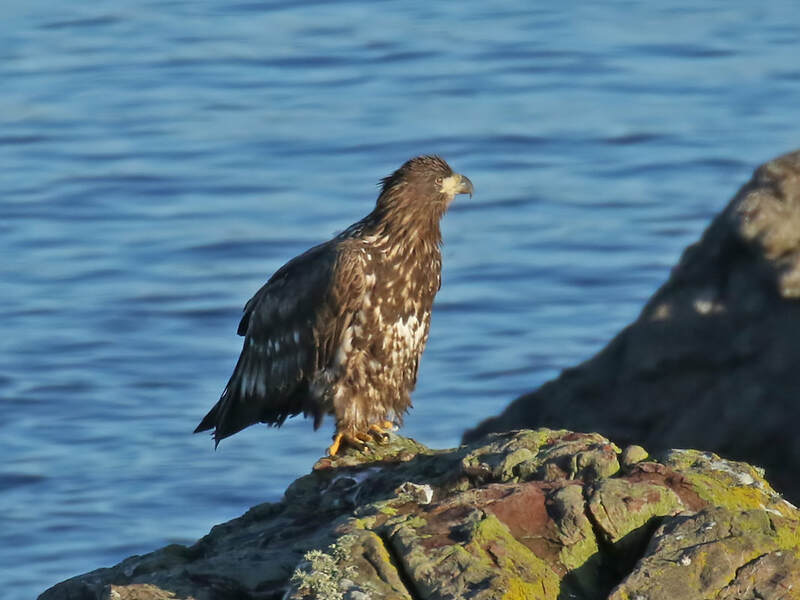 Easter Ross: The drake American Wigeon was showing in Udale Bay this morning from the hide, but on the far side of the bay (Bob Wilson). 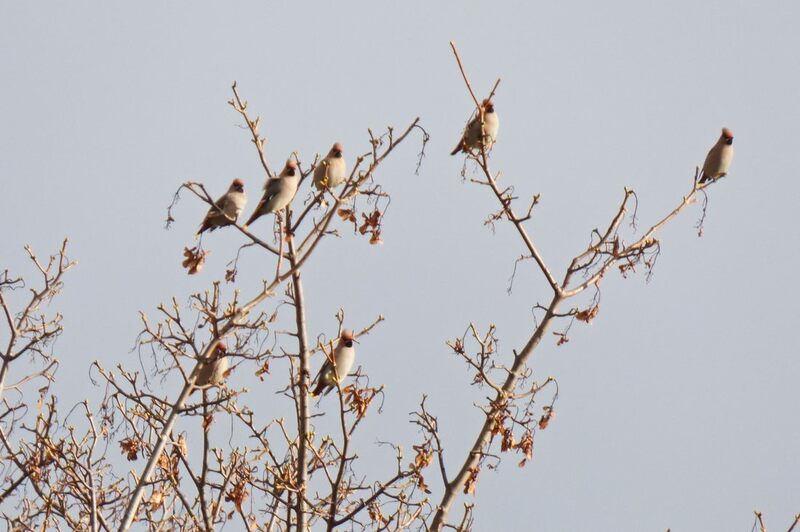 9 Waxwings on Old Evanton Road in Dingwall this afternoon (per Bob Swann). 6 Pale-bellied Brent Geese at the Rosemarkie burn mouth (Kevin Davis). 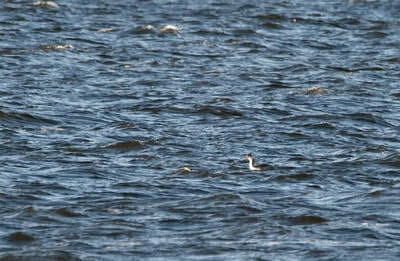 Inverness-shire: Great Crested Grebe off Alturlie (Dave Tanner). Spotted Redshank still at Easter Dalziel flood today at NH762506 (Pete Gordon). Skye and Lochalsh: 3 juvenile Iceland Gull's at Greshornish Fish Farm on Skye today. 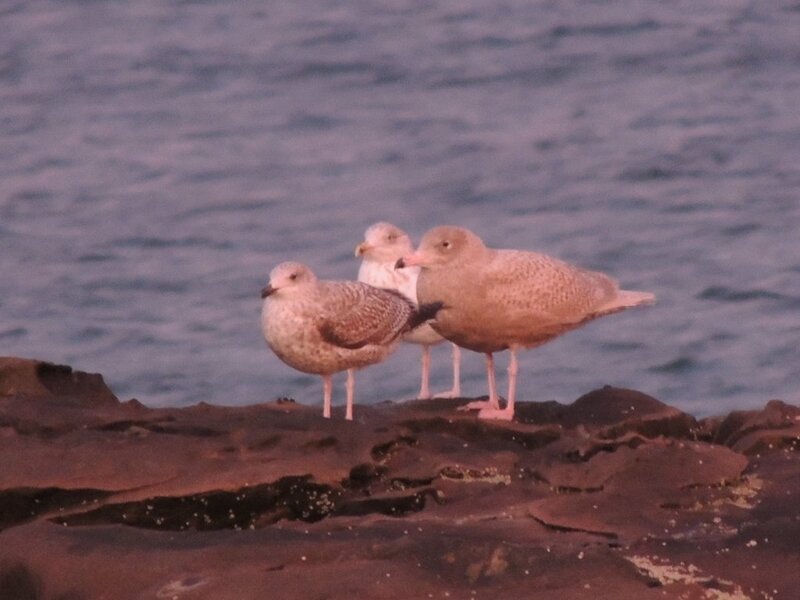 Juvenile Glaucous Gull at Ardmore, Waternish (Bob McMillan). Inverness-shire: Spotted Redshank still on the main flood and showing well close to the road at Easter Dalziel (Jon Clarke). 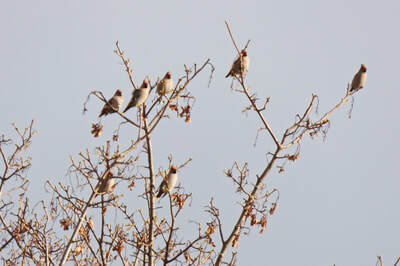 At Aldi on Telford Street, at 13.45pm, 8 Waxwings on apple tree next to the car park (Ian Herd). Little Auk found at Fanellan, near Culburnie, in a garden, blown in by winds the previous day and picked up by SSPCA. 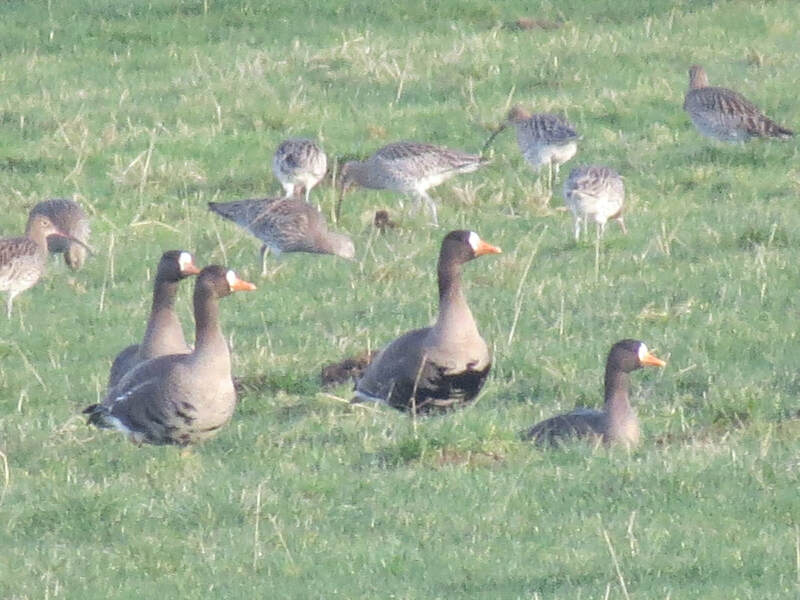 Sutherland: Single European White-fronted Goose with ca.300 Pink-feet in field on the south side of Golspie (Dean MacAskill). 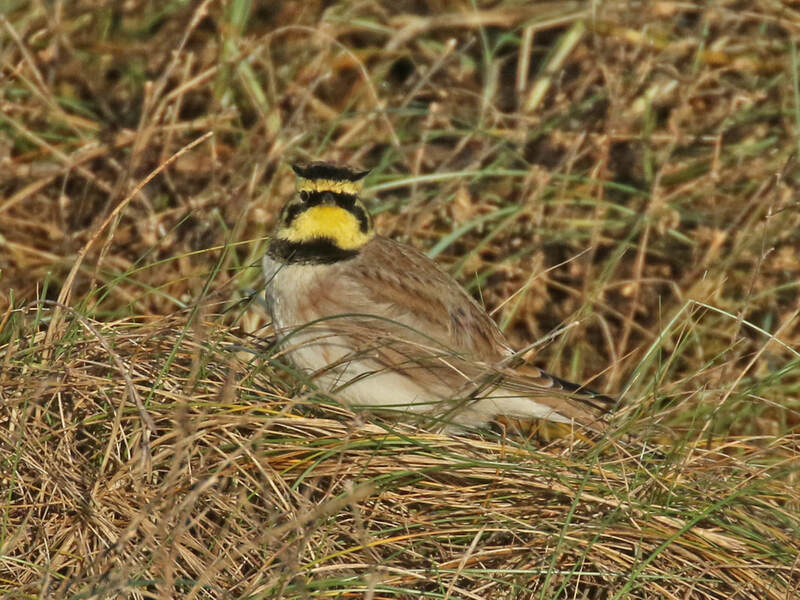 Both Shore Larks present on the tidal inlet at Coul Links at 3pm today (Simon Cohen). 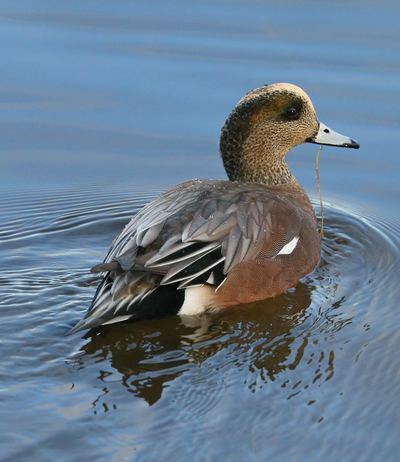 Inverness-shire: Drake American Wigeon still at Clachnaharry sea lock today (Gordon Reid). 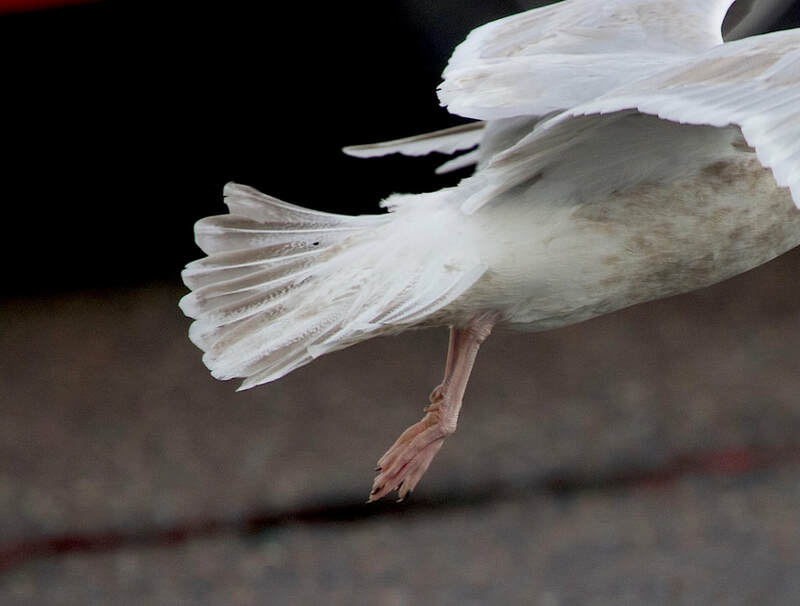 Inverness-shire: Spotted Redshank still on the main flood and showing well close to the road at Easter Dalziel, then flew a short distance southeast and landed (Jon Clarke). Sutherland: The two Shore Larks were still on the large tidal inlet at Coul Links this morning, an adult Little Gull was off Brora river mouth (Dean MacAskill). 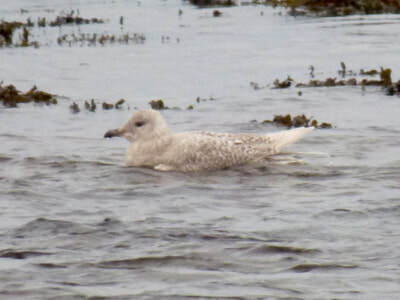 Skye and Lochalsh: Juvenile Iceland Gull at Uig Bay again today. 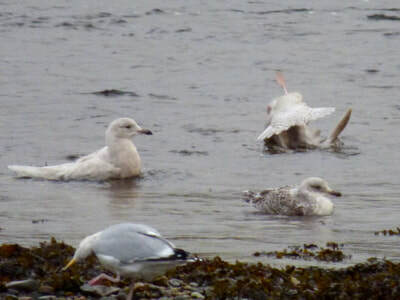 Lochaber: 3 immature Iceland and 1 juvenile Glaucous Gull preening/ resting amongst other large gulls on flooded ground by Fort William police station. In Mallaig this afternoon, 3 immature Glaucous Gulls and at least 4 Iceland Gulls, including 1 adult by west bay car park . Still 1 juvenile Glaucous Gull and 3 Iceland Gulls at Loch Ailort by the fish farm (All Stephen MacDonald). 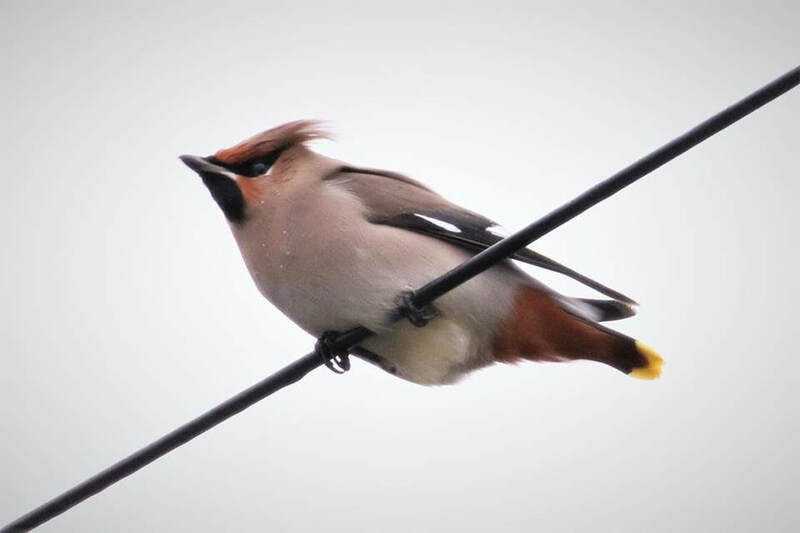 Badenoch and Strathspey: Waxwing at Grantown, near the primary school/ fire station (Simon Eaves). Iceland Gull at Granish tip, Aviemore again today (N Hammatt). Inverness-shire: 2 Waxwings in Inverness at Milton of Leys in trees behind school and stream (RBA). 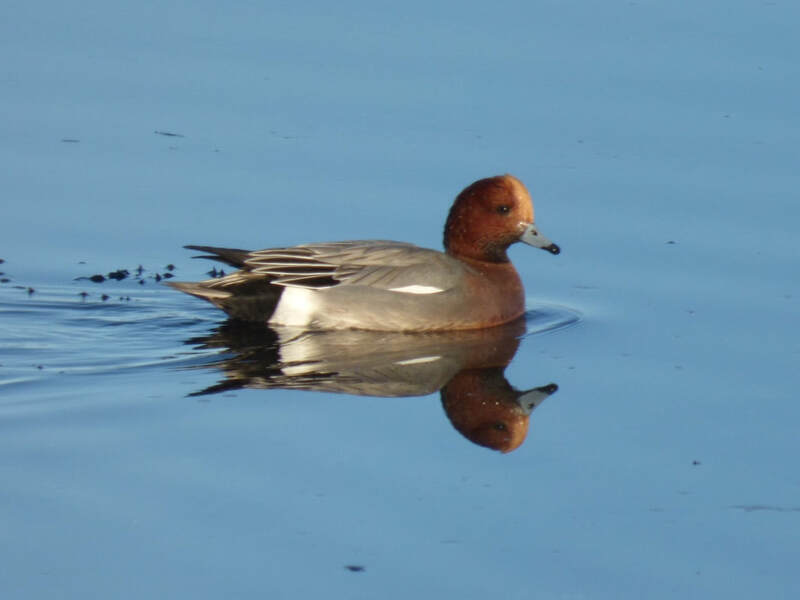 Adult drake American Wigeon still at Clachnaharry, in the lower Muirtown basin, possibly paired with a female Eurasian (David Edge, Al McNee). 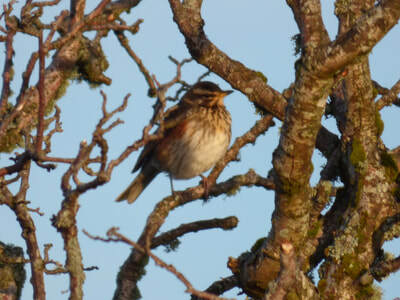 No sign of the Spotted Redshank at Easter Dalziel late morning to early afternoon. A Barnacle Goose with Pinks in field opposite the entrance to Castle Stuart Golf Club early afternoon and 9 Slavonian Grebes off Allanfearn and a Great Crested Grebe off Milton of Culloden mid-afternoon (All Al McNee). 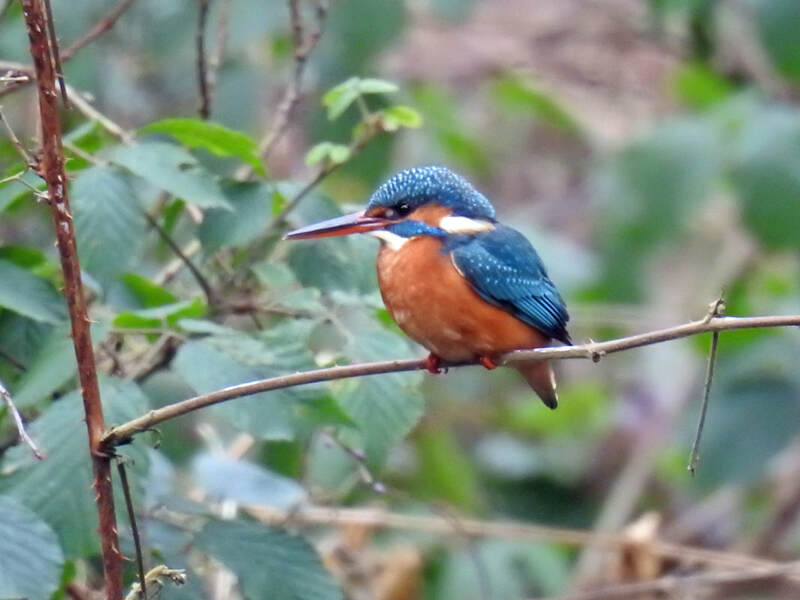 Male and Female Kingfisher at Whin Park today (David Edge). 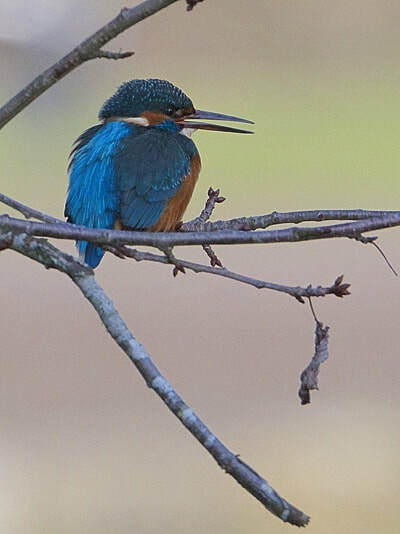 Easter Ross: Kingfisher flying downstream from the bridge at the back entrance to Tesco in Dingwall at 11.30 today (Simon Cohen). 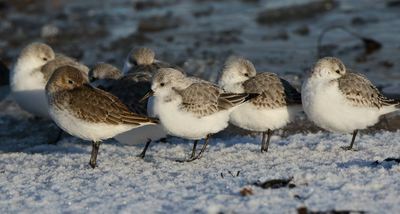 Sutherland: Apparently no sign of any Shore Larks yesterday at Loch Fleet (RBA). 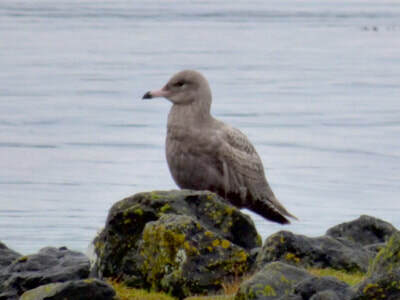 Lochaber: Juvenile Glaucous Gull at Eigg again today. Inverness-shire: Spotted Redshank still at off Dalziel Road, today in the flooded field at NH761507. Also drake Green-winged Teal back at Loch Flemington (All Steve Broyd). 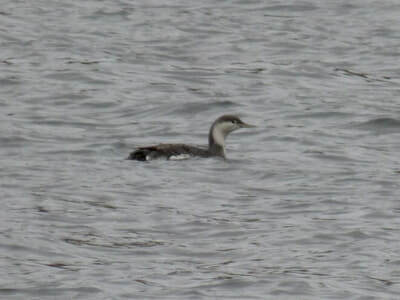 Great Crested Grebe again at Alturlie, towards Inverness at 1pm (Pete Gordon). 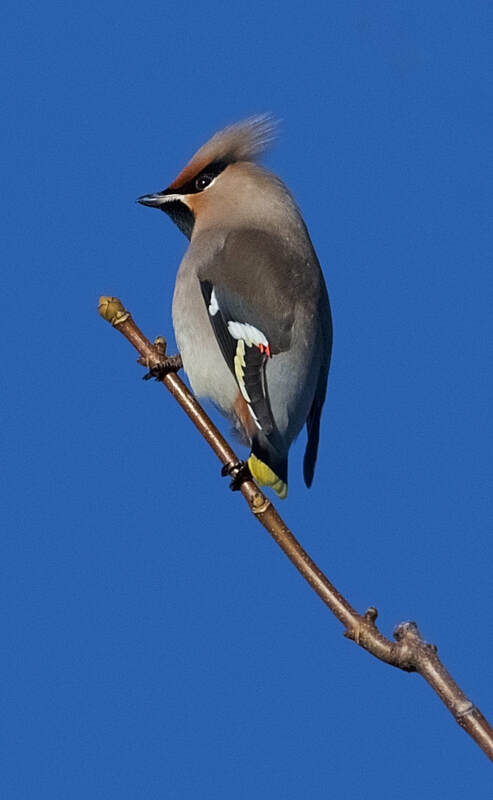 Still 7 Waxwing in the car park of Aldi in Inverness today (P Insole). 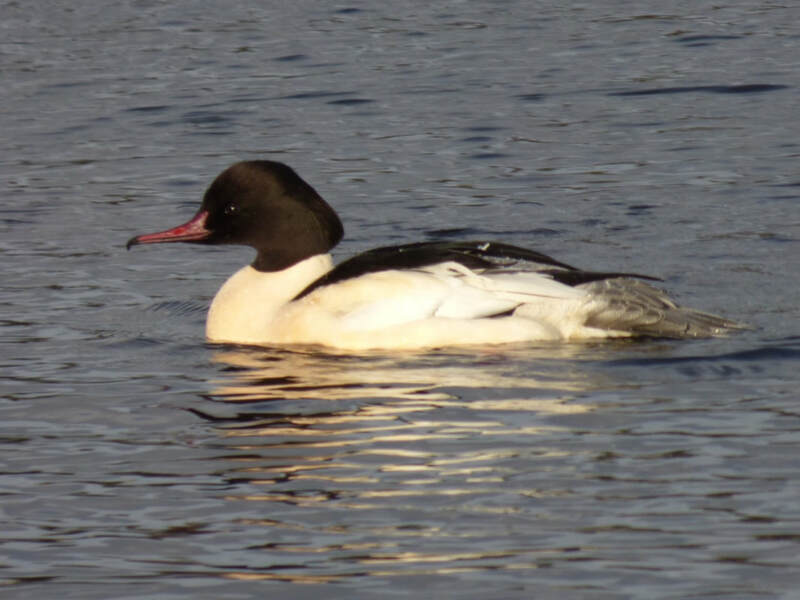 Sutherland: Drake Ring-necked Duck again at 10am at Little Loch Shin from the car park on the loch near the Doll's house (Pete Gordon). 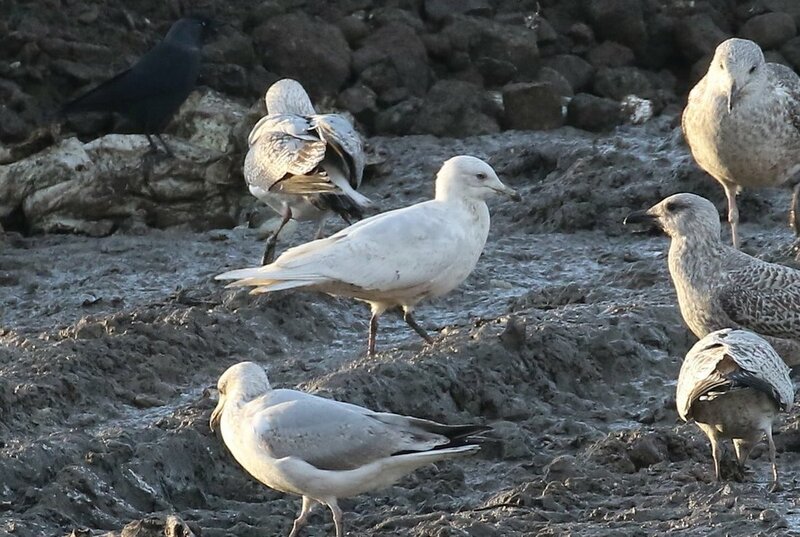 Skye and Lochalsh: 2 Iceland Gulls at Portree at Bayfield (Jonathan Jones). 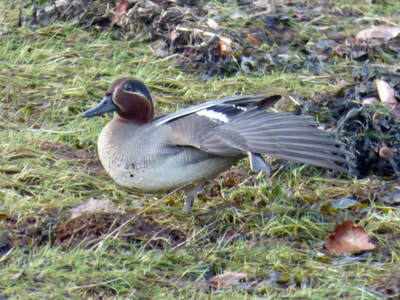 Easter Ross: Drake American Wigeon still off the links car park at the river mouth in Tain today (Bob Swann). 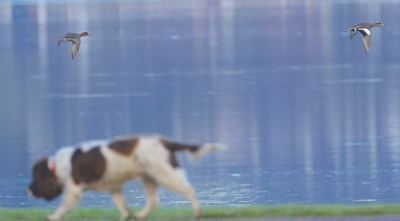 A Gadwall on Loch Evelix (Dean MacAskill). Badenoch and Strathspey: Barn Owl flew over B970 near Nethy Old Kirk this evening about 2155pm (Peter Norgate). 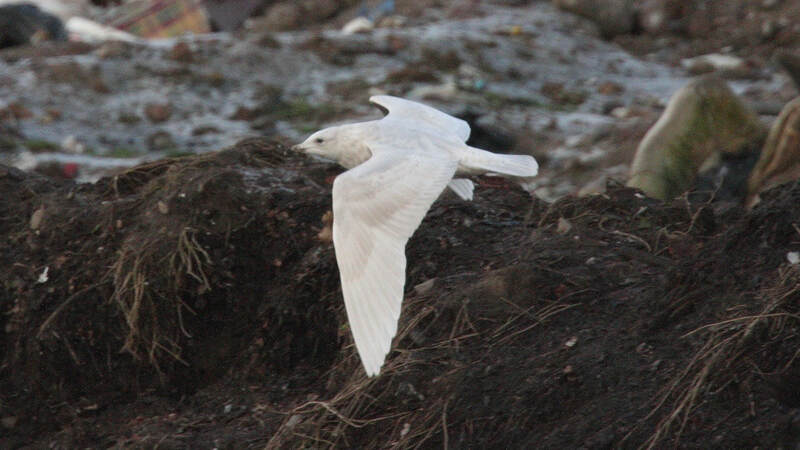 Iceland Gull at Broadford Bay (Neil Bennett). 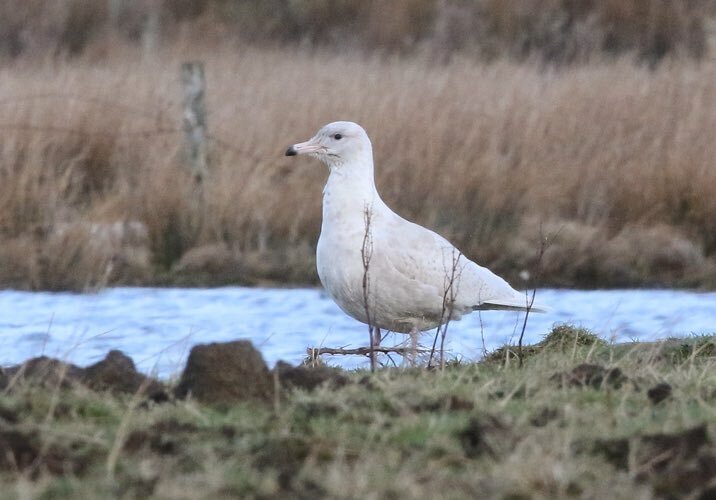 Iceland Gull at Broadford Bay (Neil Bennett)..
Badenoch and Strathspey: Iceland Gull in field to south of Granish tip at Aviemore this afternoon (Pete Gordon). Inverness-shire: Two Kingfishers at the boating park in Whin Park, Inverness today at 1600pm (Alan MacAskill). 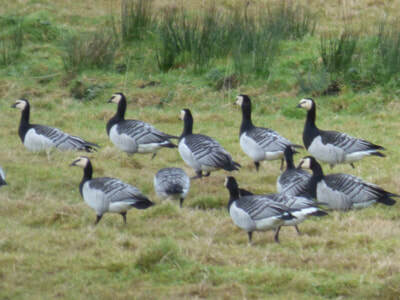 Three Barnacle Geese amongst 100 Pink-feet in field immediately east of Braeside Park, Balloch (David Reid). 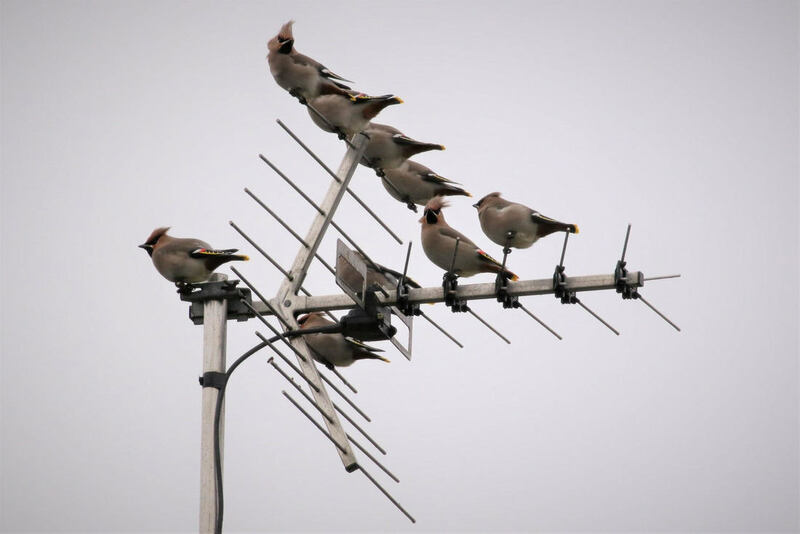 8 Waxwings still behind Aldi this afternoon (RBA). Spotted Redshank still at off Dalziel Road, today in the flooded field at NH761507 (Jon Clarke). 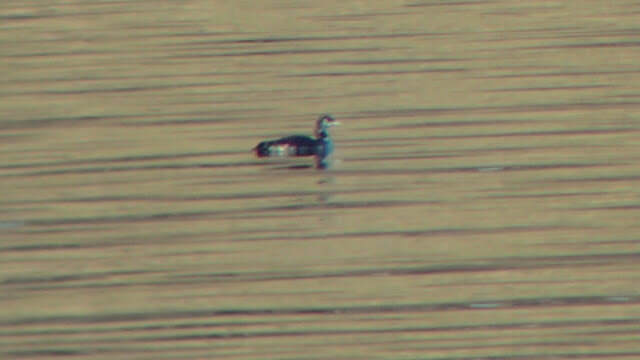 Drake American Wigeon again at Clachnaharry sea lock today (N Hammatt). 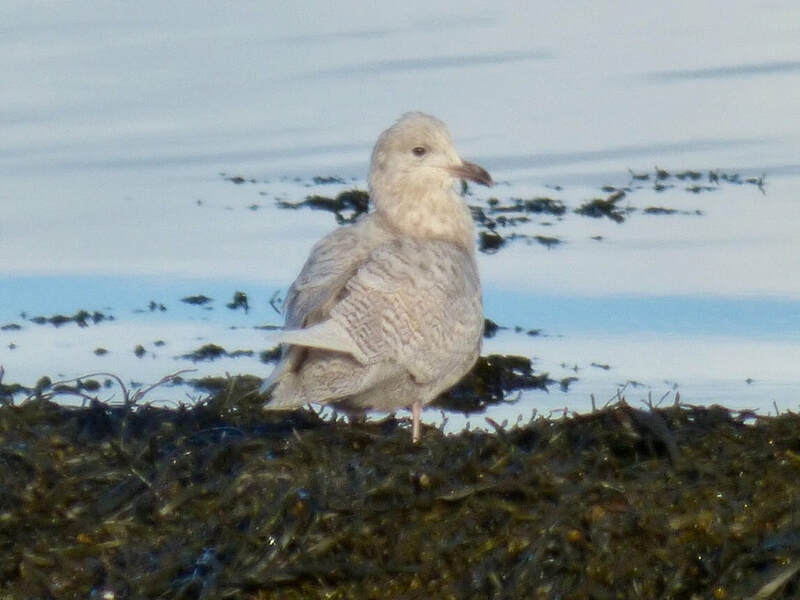 Lochaber: Juvenile Glaucous Gull still on Eigg this morning (John Chester). Skye and Lochalsh: Juvenile Glaucous Gull at Torrin at Camus Malag this morning NG581193 (Bob McMillan). 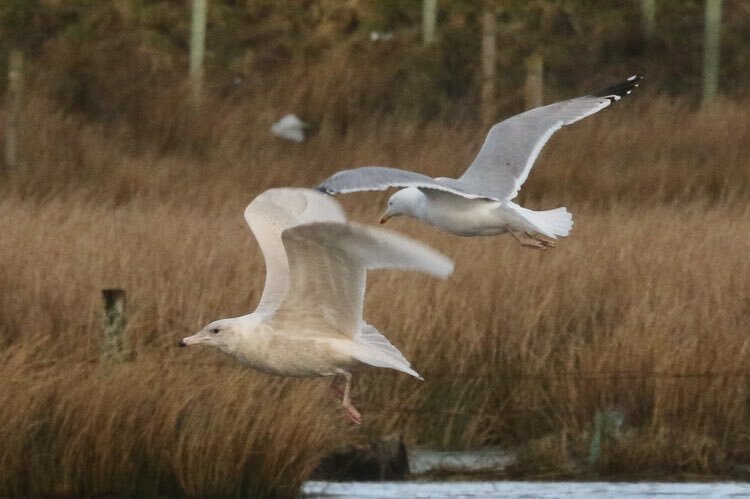 2 juvenile Iceland Gulls in Portree at Bayfield today. 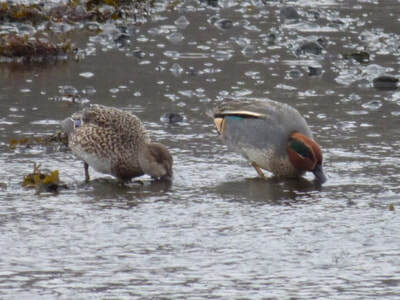 Easter Ross: Drake American Wigeon still off the links car park at the river mouth in Tain at 1530pm (RBA). 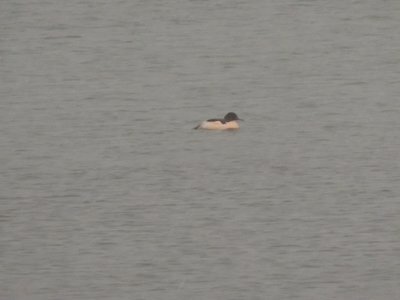 Sutherland: Drake Ring-necked Duck still at Little Loch Shin viewed from the Spar shop in Lairg (Martin Benson/Dean MacAskill). 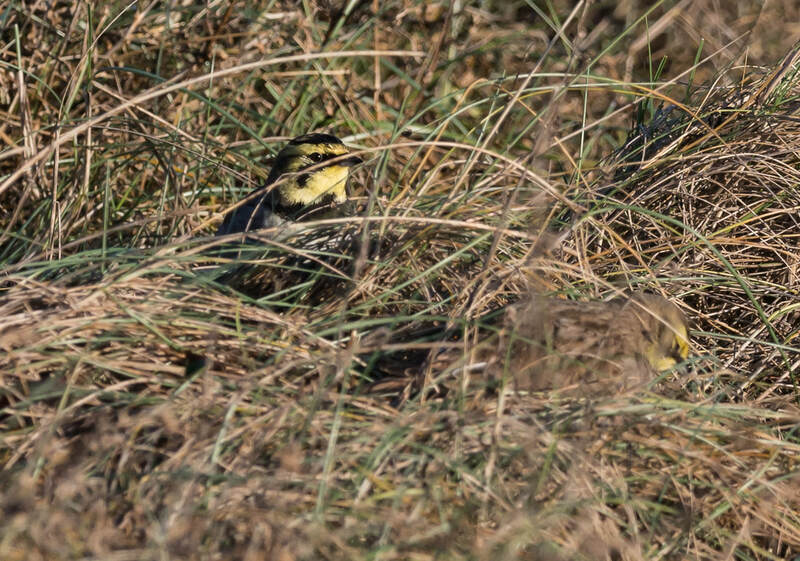 Both Shore Larks still present at Loch Fleet usual location (Martin Benson). Inverness-shire: 2 Kingfishers in Whin Park, Inverness by the boating pond bridge (Martin Benson). 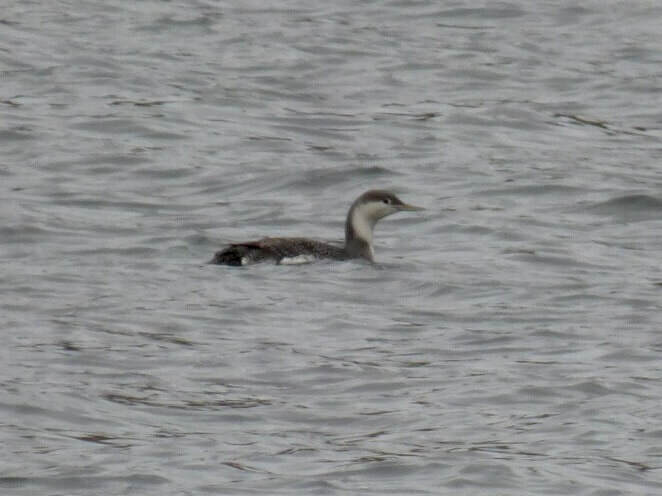 Great Crested Grebe still at Alturlie (Colin Leslie). 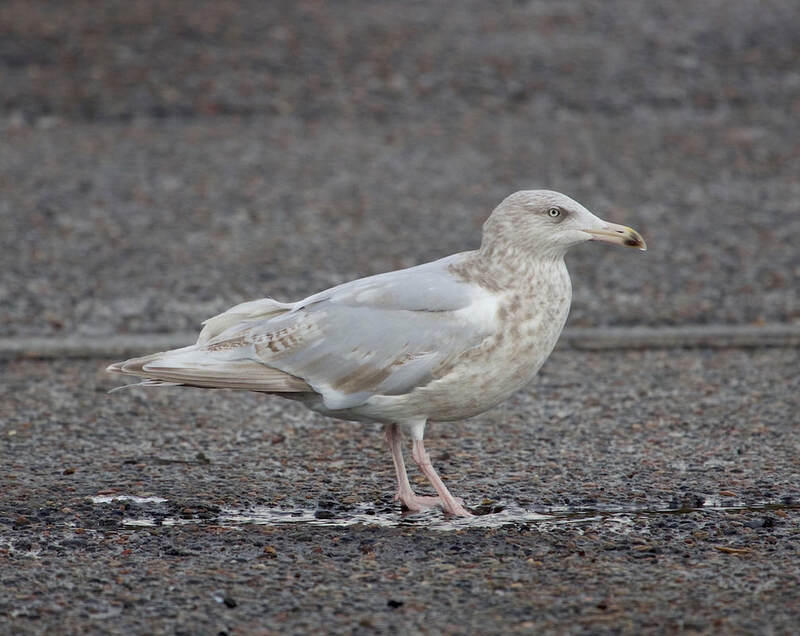 Lochaber: 2 First-winter Glaucous Gull still at Caol, on the spit (Tony Laidler). First winter Glaucous Gull at Kildonan, Eigg (John Chester). 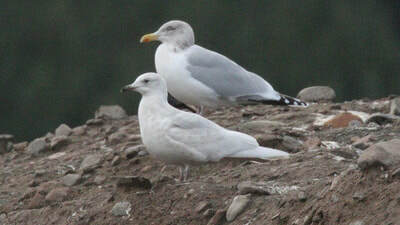 Skye and Lochalsh: Two Iceland Gulls at Bayfield, Portree (Jonathan Jones). Also Glaucous Gull at Lower Milovaig, Glendale, (Andy Stables). 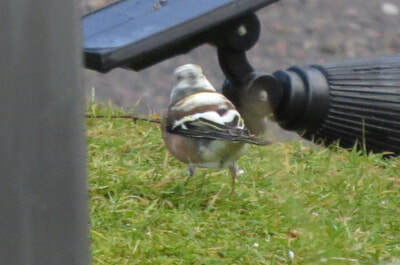 Leucistic Chaffinch at the Mound (Dean MacAskill). 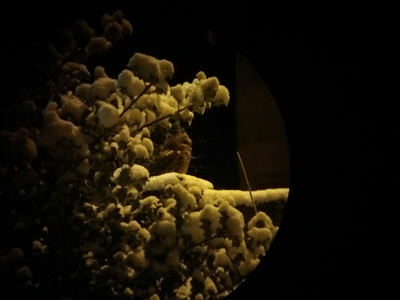 Inverness-shire: At least 8 Waxwings still around the city centre Aldi car park, feeding in Apple tree at back of car park (Andy Howard/Jon Clarke). 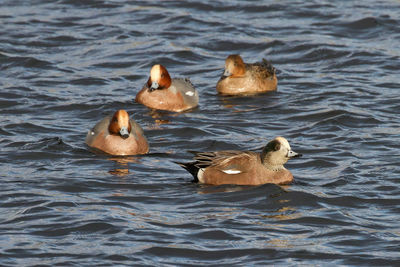 Adult drake American Wigeon still at Clachnaharry sea lock today (Martin Benson). 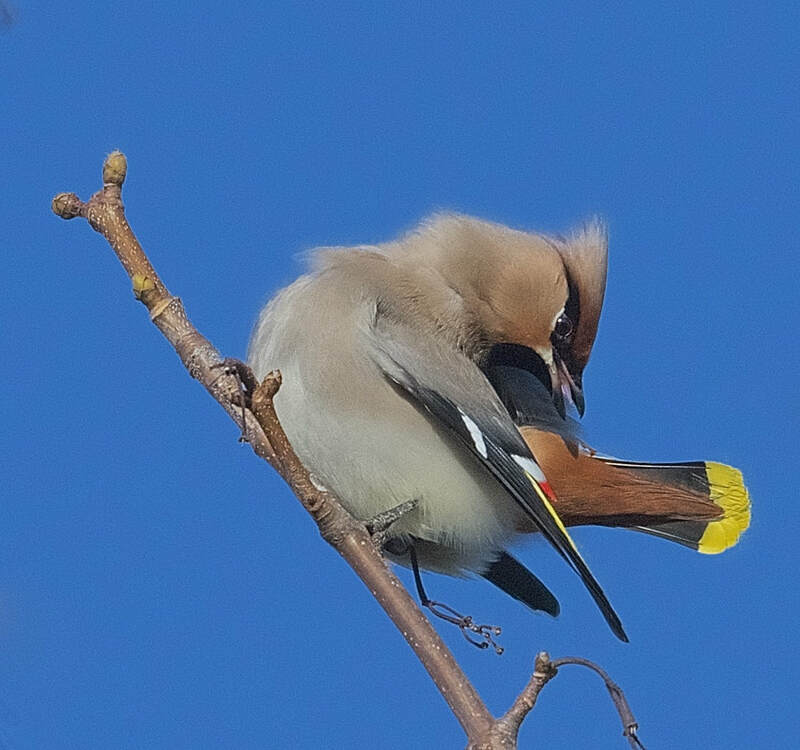 Waxwings in Inverness (Colin Leslie). 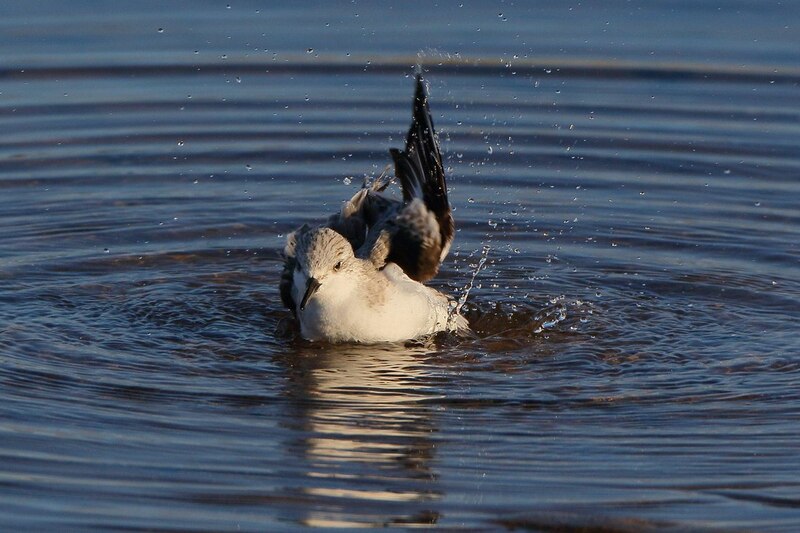 American Wigeon at Clachnaharry (Martin Benson). American Wigeon at Clachnaharry (Martin Benson)..
Lochaber: First-winter Glaucous Gull at the mouth of the River Lochy, Fort William at NN111750, also 2 first-winter Glaucous Gulls at Caol at NN107757 (Tony Laidler). 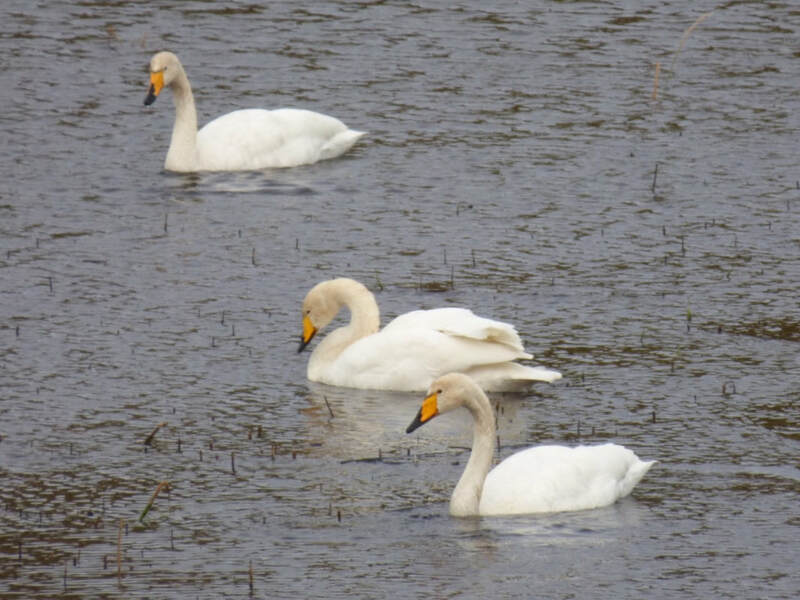 Easter Ross: Bean Geese reported on the road between Charleston and Redcastle at the Charlestown end, with pinkfeet (A Howard). Sutherland: 2 First-winter Glaucous Gulls in Lochinver bay today (Assynt Wildlife). 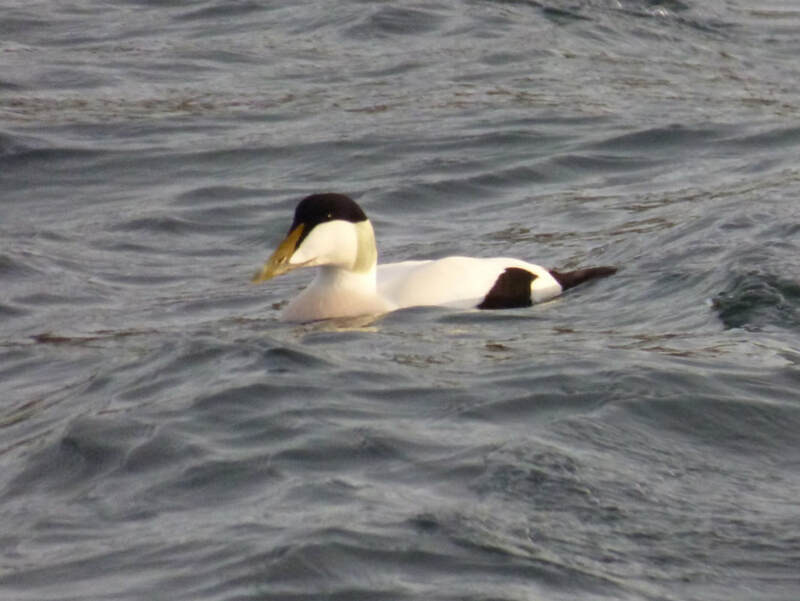 Skye and Lochalsh: No sign of the White-billed Diver in Uig bay (Jonathan Jones). 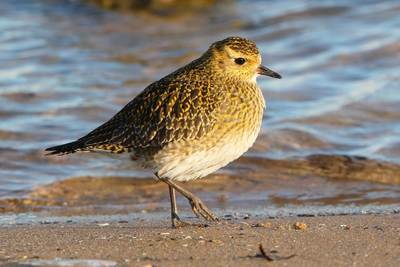 9 Snipe seen drifting out on the tide on an ice floe (!!!) at Lochlonghead near Dornie (Paul Speak). 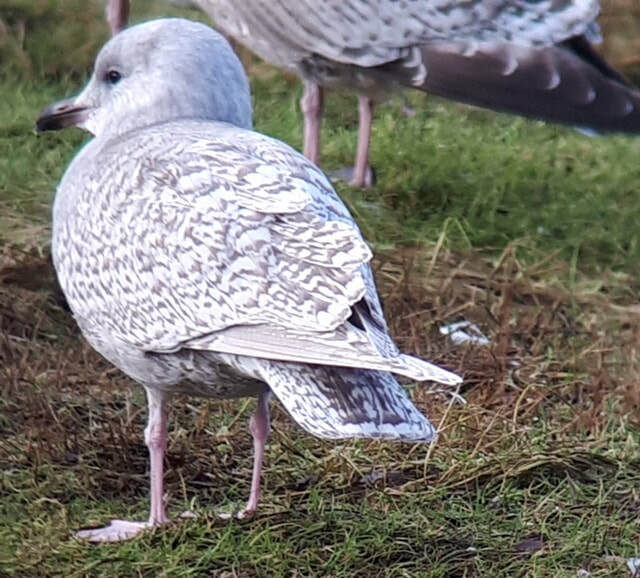 Badenoch and Strathspey: 2 Iceland Gulls (2CY and 3CY) again at Aviemore tip (Toby Green). Skye and Lochalsh: Adult White-billed Diver in Uig Bay (Martin Lumb and Seth Gibson), also an Iceland Gull there and also at Broadford Bay. Easter Ross: 420 Scaup at Jemimaville and 40+ Slavonian Grebes . 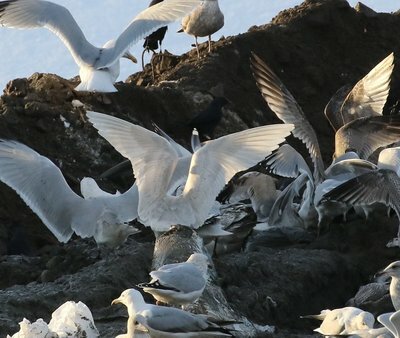 At Udale bay approx 4250 Common Gull (Mary Galloway). 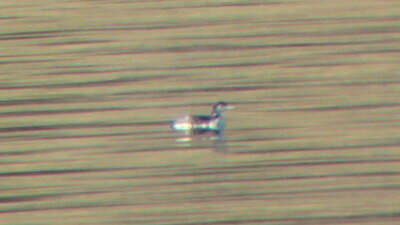 White-billed Diver at Uig (Seth Gibson). 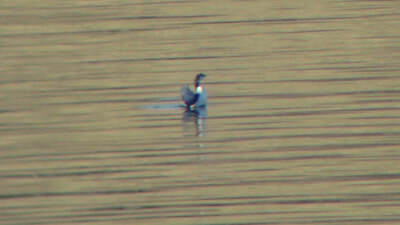 White-billed Diver at Uig (Seth Gibson)..
Skye and Lochalsh: Whimbrel at Bayfield, Portree at 1.30pm (Jeff Lawson). 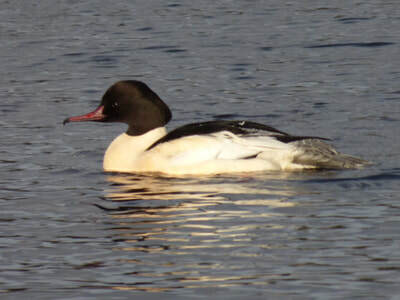 Lochaber: Drake Goosander at Loch Scresort, Rum (Sean Morris). 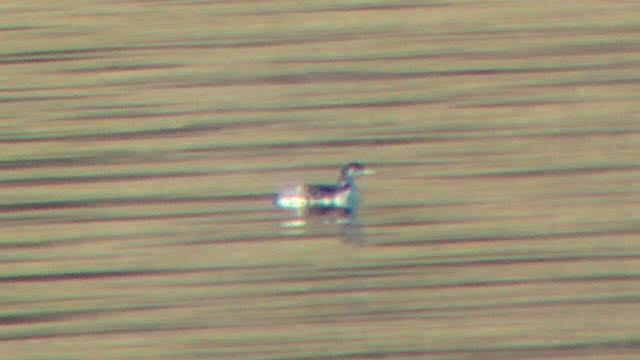 Easter Ross: Drake American Wigeon again at Tain (G Aitken, R Dennis). Green Sandpiper on Shaltie burn in Avoch today (B Etheridge). 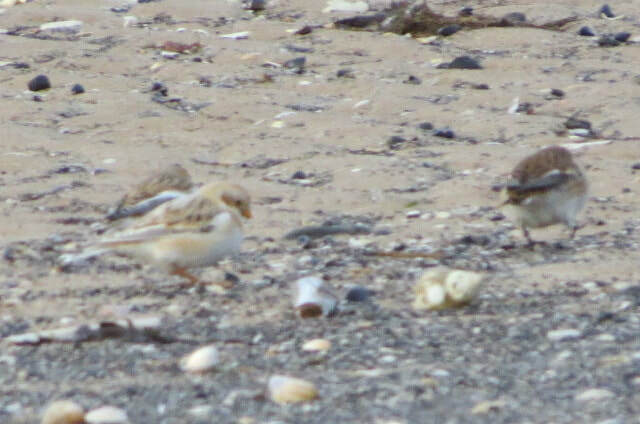 Single Snow Bunting at Alness Point (Jimmy Fraser). Inverness-shire: Drake American Wigeon at Clachnaharry sea lock again today (James Gordon). 92 Fieldfare in a field near Ardersier (Colin Leslie). Snow Bunting at Alness (Jimmy Fraser). Lochaber: First-winter Iceland Gull on Rum today at Kinloch (Sean Morris). Three immature iceland Gulls in Mallaig harbour today also (S MacDonald). 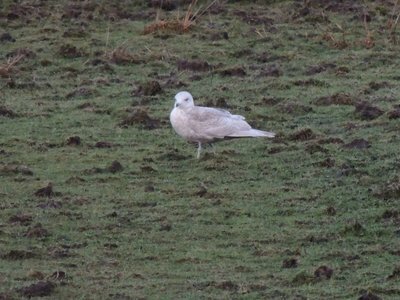 Badenoch and Strathspey: Two Iceland Gulls at Granish tip, Aviemore this afternoon, a second-winter and a first-winter (Toby Green). Sutherland: Two Shore Larks still at Loch Fleet today (Dean MacAskill). 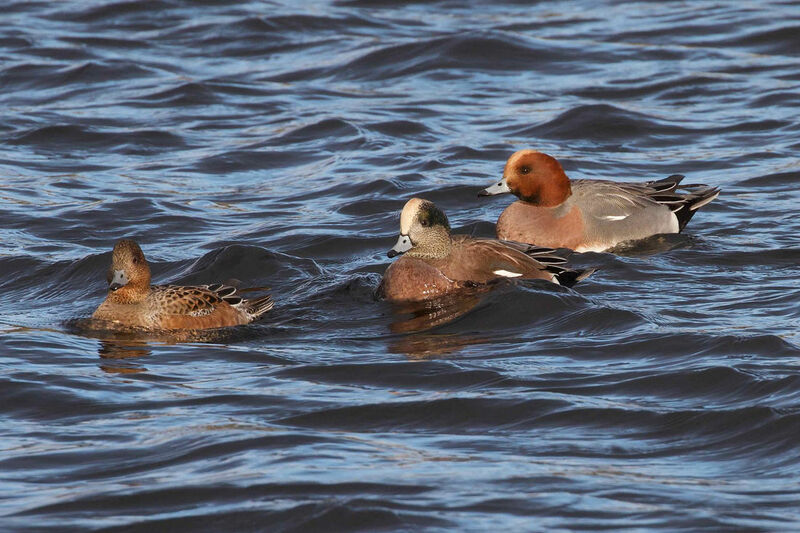 Inverness-shire: Drake American Wigeon still at Clachnaharry sea lock today (Jonathan Jones). Iceland Gull at Aviemore tip (Toby Green). 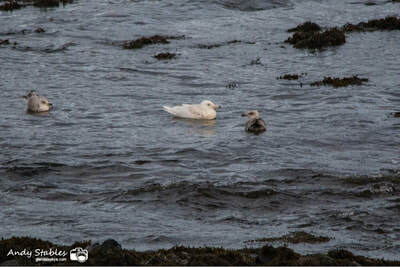 Iceland Gull at Aviemore tip (Toby Green)..
Easter Ross: A Long-eared Owl was seen in a garden in Dingwall last night! 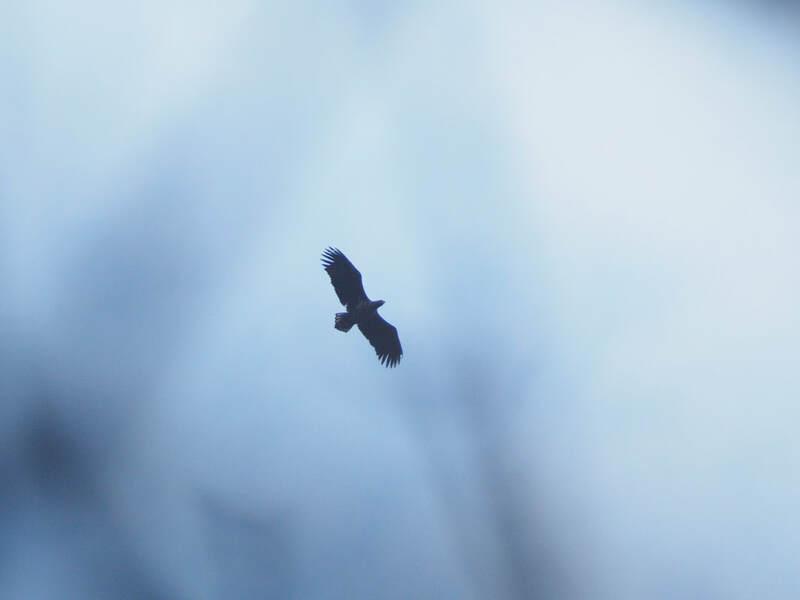 (Andrea Goddard). 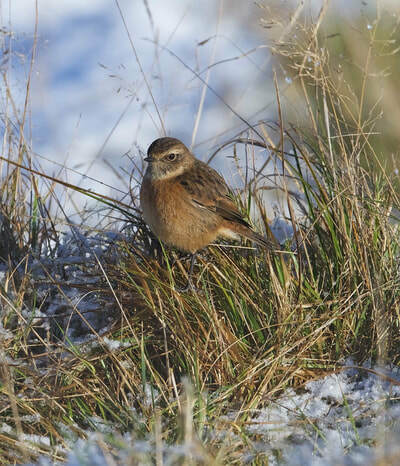 Badenoch and Strathspey: 7 Little Grebes on the Spey between Broomhill Bridge and the River Dulnain (Pete Gordon). Inverness-shire: Four Waxwing on Caledonian Road, Inverness (Birdguides). 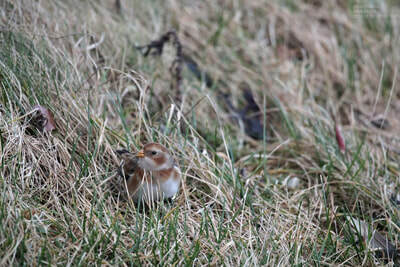 Sutherland: Jack Snipe and 10 Snow Bunting at Dornoch point (Dean MacAskill). 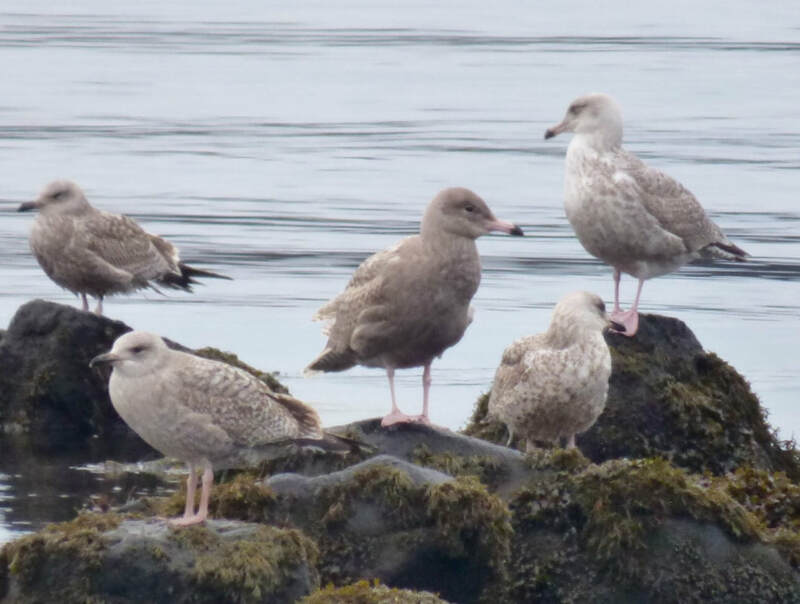 Lochaber: Three juvenile Iceland Gulls and a single juvenile Glaucous Gull at the fish farm cages at Loch Ailort (S MacDonald). Long-eared Owl in Dingwall (Andrea Goddard). 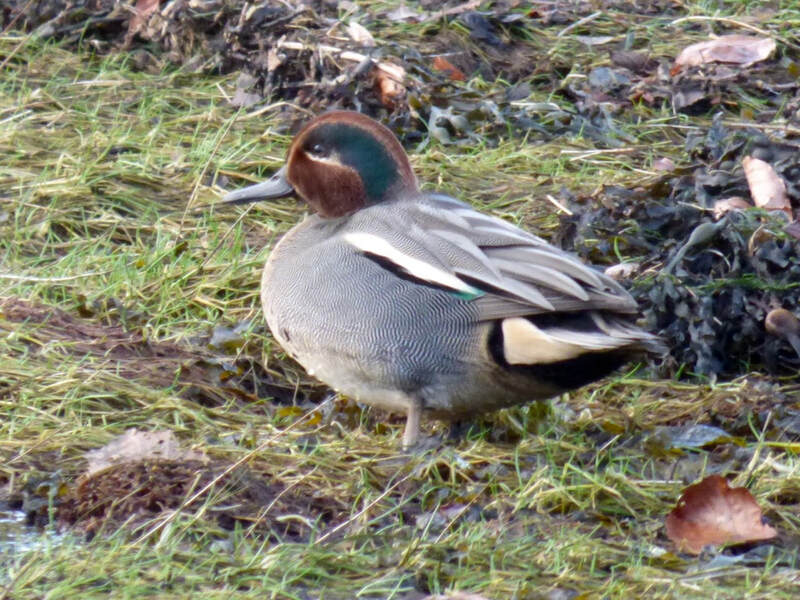 Inverness-shire: Drake American Wigeon still at Clachnaharry sea lock today. 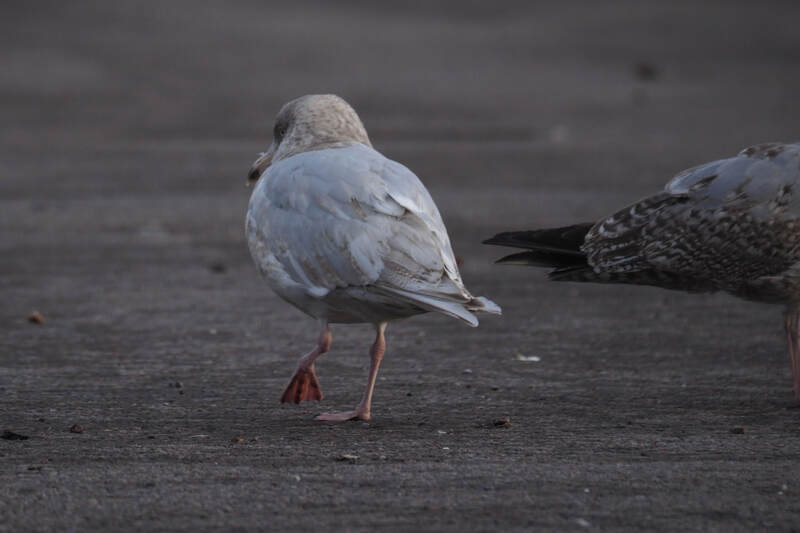 Immature Iceland Gull on River Ness in city centre late afternoon (RBA). 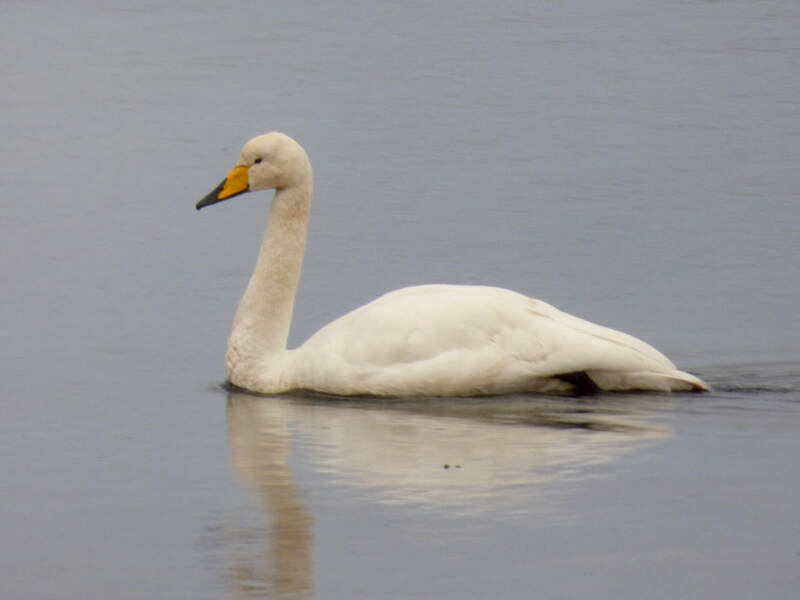 Single Barnacle Goose at Wester Dalziel and an leucistic Pinkfoot, also ca.500 Skylarks at Alturlie and 39 Scaup and 50 Meadow Pipits (All Pete Gordon). Lochaber: Three immature Iceland Gulls around the fish farm cages on Loch Ailort (S MacDonald). 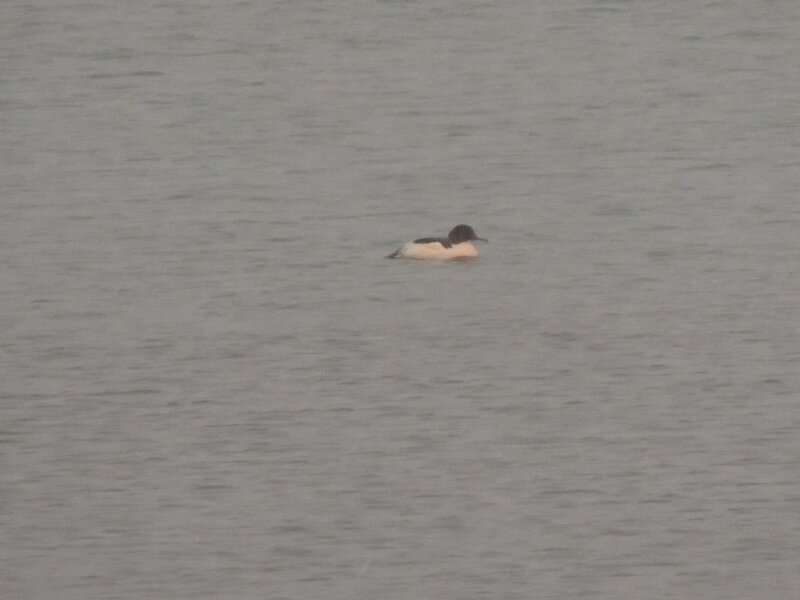 Sutherland: Drake Ring-necked Duck still on Little Loch Shin today, viewed from the main car park in Lairg (RBA). 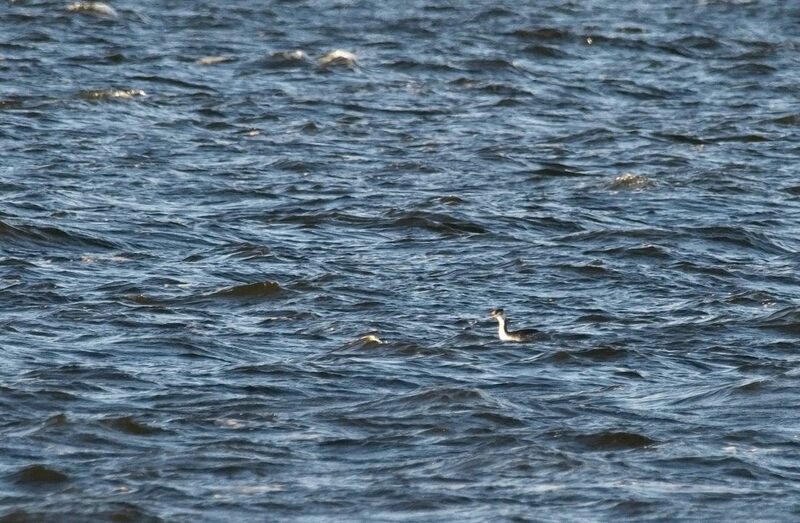 Inverness-shire: Spotted Redshank back on the flood on Dalziel Road, Ardersier late morning, also Barnacle Goose (Jon Clarke). Also 2 Kingfishers on the slalom stream at Whin Park, Inverness (Al McNee). 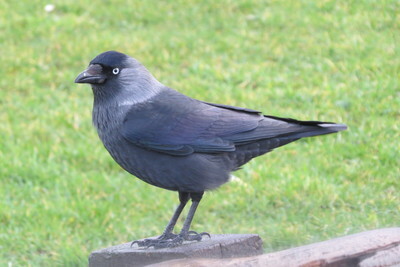 Easter Ross: Nordic-type Jackdaw at Dornoch again today (Dean MacAskill). 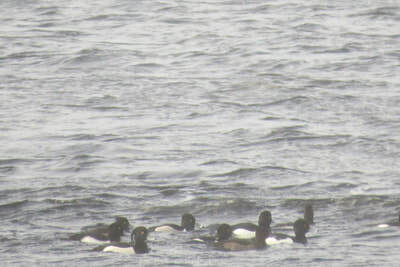 Sutherland: Drake Ring-necked Duck at Little Loch Shin at 1115am, best viewed from main carpark in Lairg looking northwest towards the dam, with a flock of Tufted Duck (Mike Hoit). 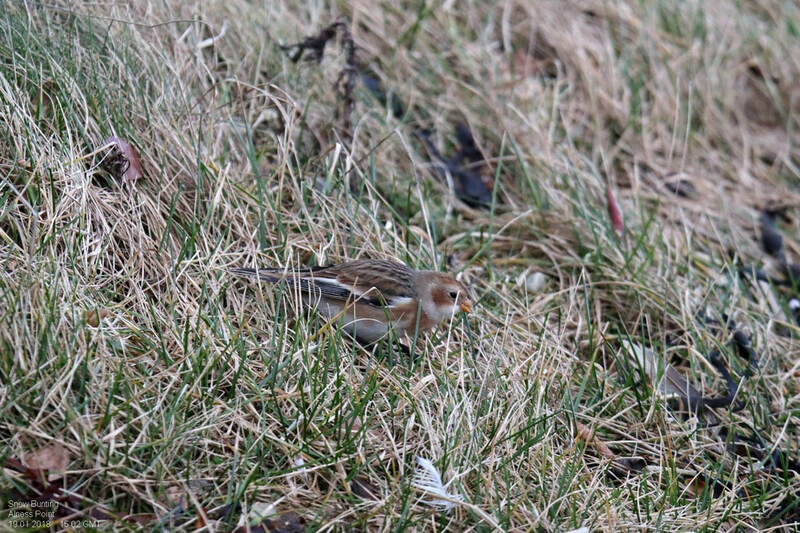 Video of the bird here. Lochaber: Water Rail at Kinloch today (Sean Morris). 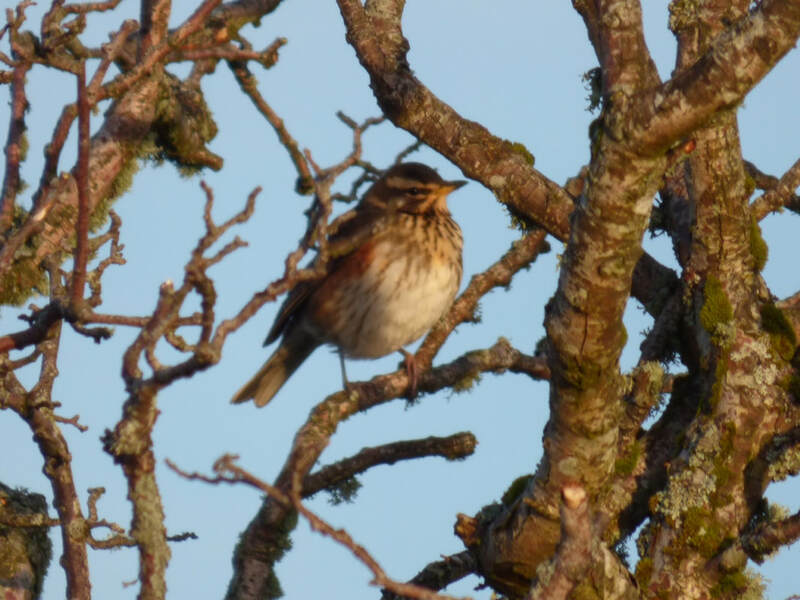 Skye and Lochalsh: Jack Snipe at Scullumus, Broadford (Martin Benson). 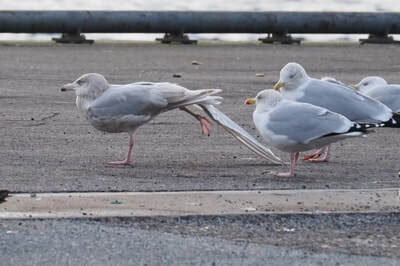 Inverness-shire: Three Waxwings in the car park of Lidl at 1309pm. 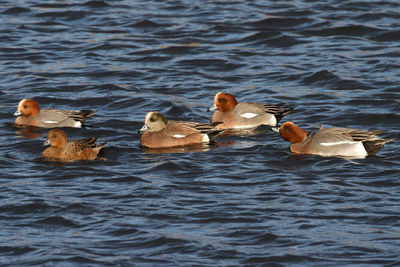 Also drake American Wigeon still at Clachnaharry today (All Kate Clarke). 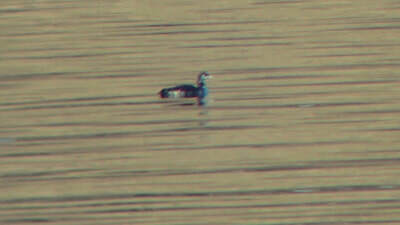 Easter Ross: 15 Barnacle Geese on Loch Eye (Clair Bale). 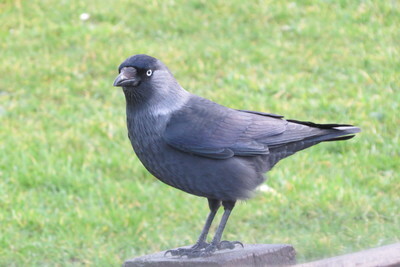 Sutherland: Black Redstart at Dornoch at the beach carpark, 100 yards south of the car park at 2.10pm (Birdguides). Easter Ross: Single European White-fronted Goose with a large flock of pinkfeet at Strath of Pitcalnie, near Nigg at NH830747. 8 Stock Dove at Calrossie Woods near Tain (All Bob Swann). 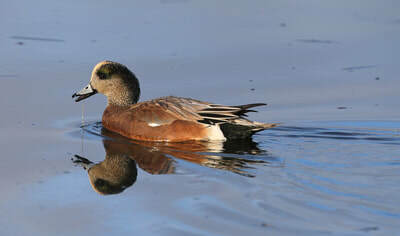 Inverness-shire: Drake American Wigeon still at Muirtown Basin today (Tom Wells). Sutherland: Both Shore Larks still present in usual spot Coul Links, 4 Purple Sands Embo, 40+ Sanderling at Brora, 4+ Little Gulls distantly from Lothbeg point (At least 1 adult & 3+ 1st winters). Kingfisher under the A9 bridge at the mound (All Jon Clarke). 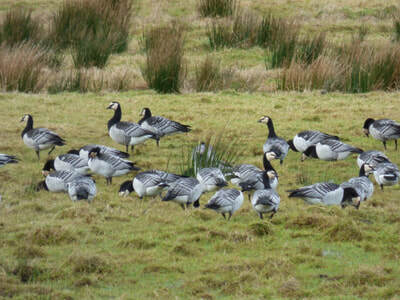 Inverness-shire: Single Barnacle Goose with Pinkfeet at Dalcross (Derek McGinn). 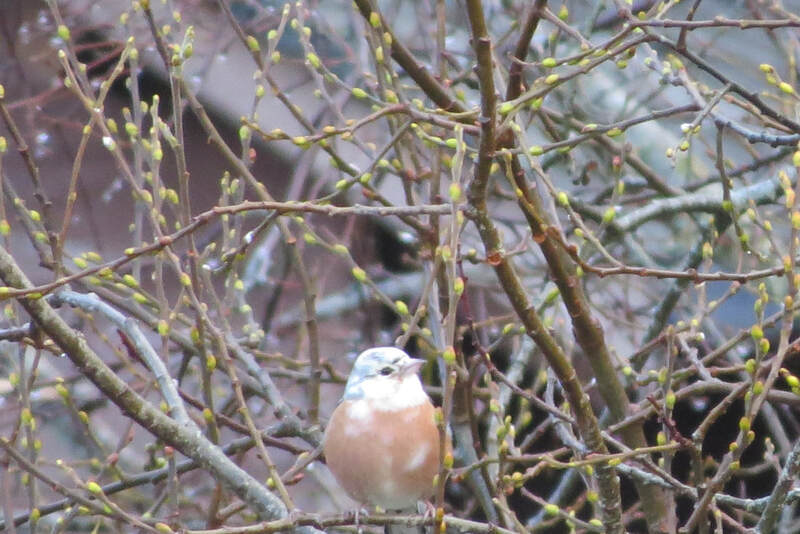 Easter Ross: At least 12 Bramblings with Chaffinches in roadside trees at Coulmore Bay Caravan Park, Beauly Firth (Lynden Schofield). Wester Ross: 120 Barnacle Geese in a field by Gruinard Bay at NG964937 (viewed from lay-by at NG960929). 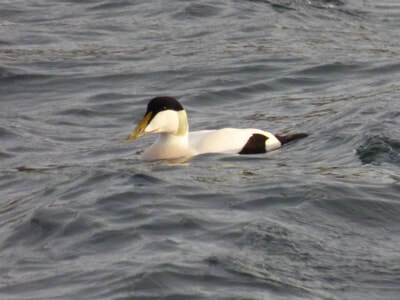 30+ Great Northern and 6 Black-throated Divers in Gruinard Bay and 5 Great Northern Divers at Altbea. 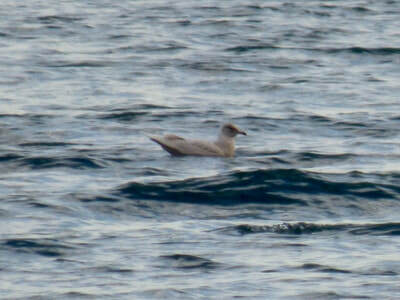 Lochaber: Juvenile Iceland Gull on the Canna ferry from Mallaig (Birdguides). Skye and Lochalsh: Juvenile Iceland Gull in Uig bay still (Seth Gibson). 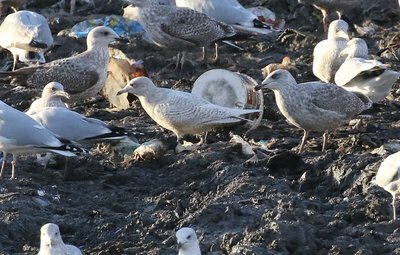 Badenoch and Strathspey: Iceland Gull came into the gull roost at Loch Alvie at 4pm this afternoon, not seen at the dump today (Mark Warren). 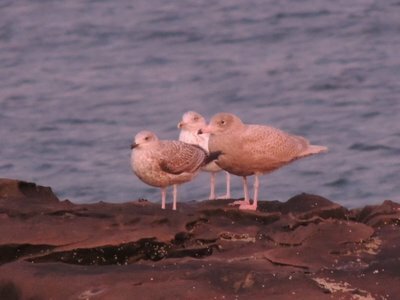 Sutherland: Adult, 2nd winter and first-winter Title gull off Brora river mouth at 1616pm (Birdguides). Easter Ross: Drake American Wigeon still at Tain Links this afternoon (Bob Swann). 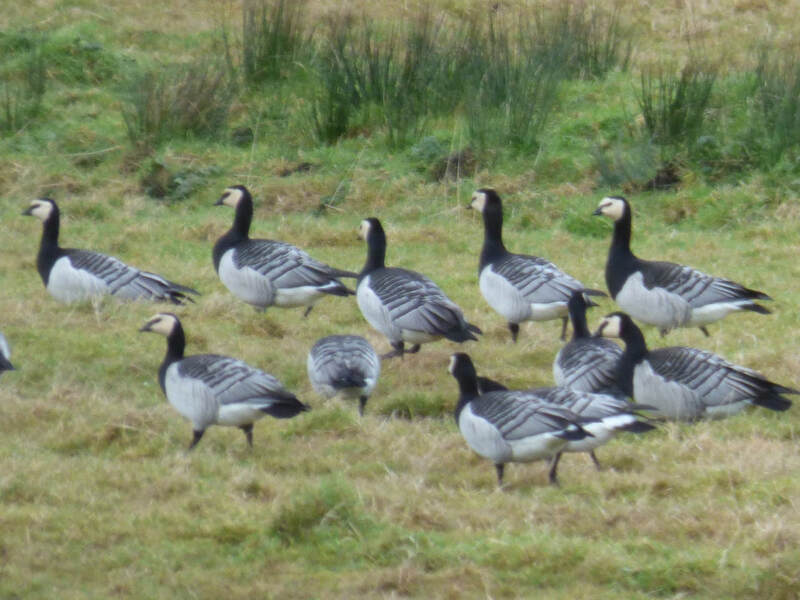 Also 60 Barnacle Geese on a mostly frozen Loch Eye and still c60 Scaup and c80 Coot on the loch. 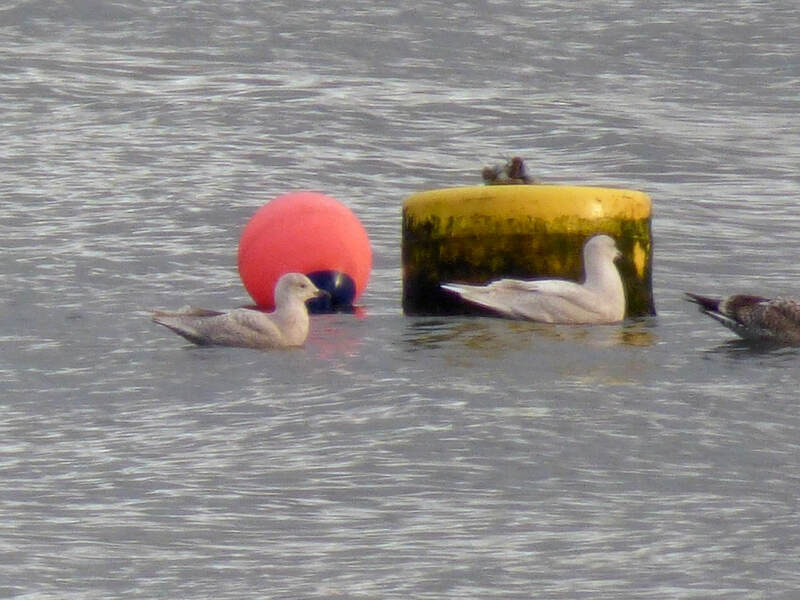 Inverness-shire: Drake American Wigeon still at Clachnaharry sea lock this afternoon (Dave Pullan).Glaucous Gull reported in the gull roost on the River Ness by the Water Front pub upstream of the A82 bridge (H and M Facebook group). 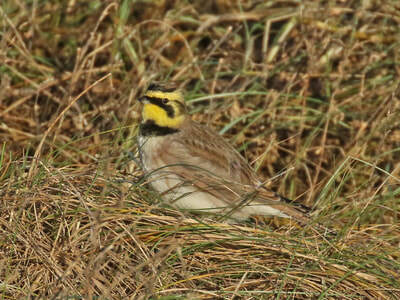 Sutherland: Two Shore Larks still at Coul links this afternoon at 1342pm (Mark Warren). 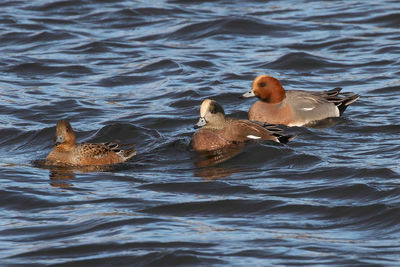 Easter Ross: Drake American Wigeon at Tain today (Bob Swann). 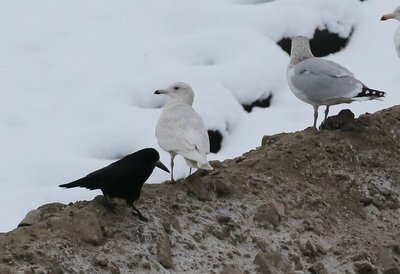 Badenoch and Strathspey: Iceland Gull at Aviemore tip again at 1500pm, then flew to the gull roost on Loch Alvie (Simon Eaves). 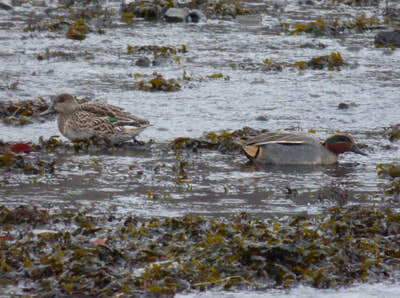 Lochaber: Drake American Wigeon still at Caol on the spit at NN107752 (Tony Laidler). Skye and Lochalsh: Still two juvenile Iceland Gulls at the Loch Ailort Fish Farm (S MacDonald) and two first-winters at Black Rock, Portree (NB, JDJ). 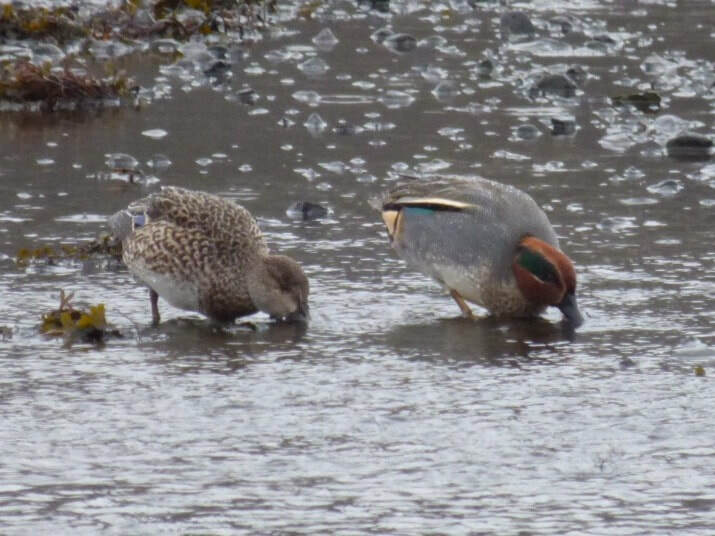 Teal at Bayfield, Portree (Neil Bennett). 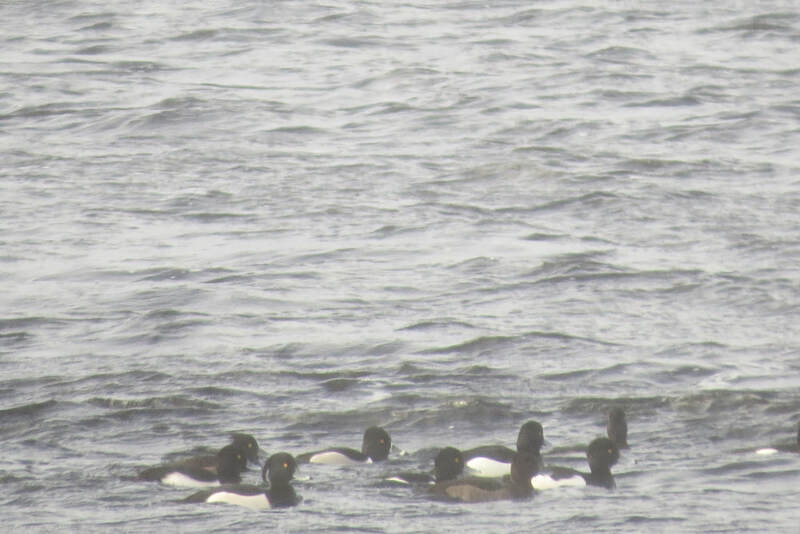 Lochaber: Drake Ring-necked Duck again on Loch Shiel at Acharacle with 23 Tufted Ducks at NM681679 at 1045am (Andrew Dacre). 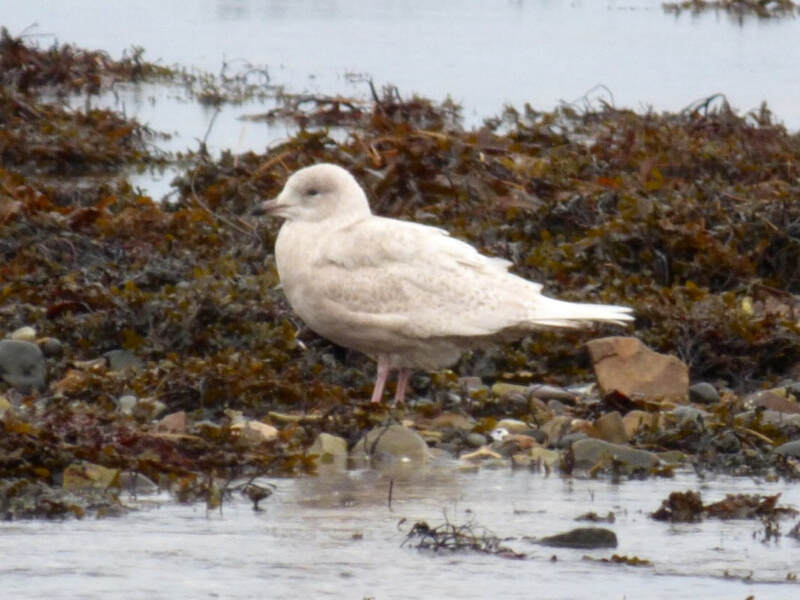 First-winter Glaucous Gull at Kilmory, Rum today (Sean Morris). 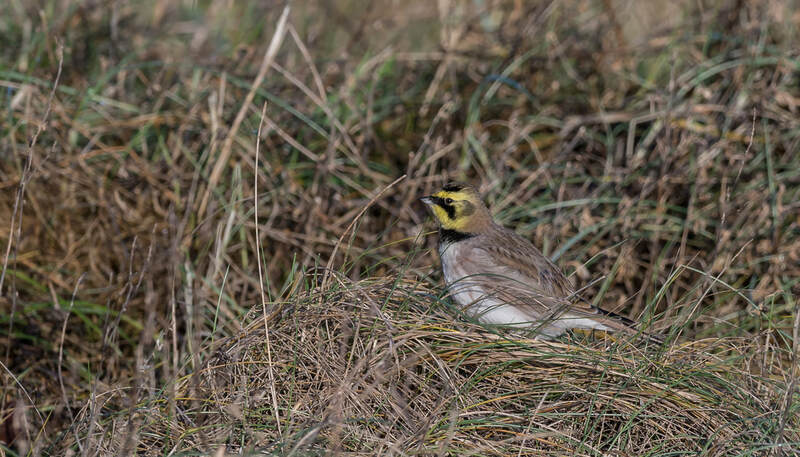 Sutherland: Two Shore Larks still at Coul Links today at 1130am at NH80899535 (Pete Gordon). 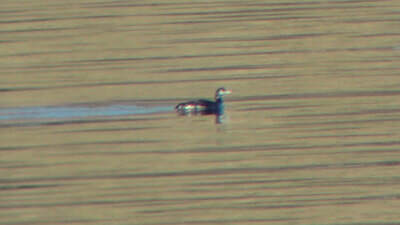 Drake Gadwall on Loch Evelix (Bob Swann). Easter Ross: 9 Pale-bellied Brent Geese at Rosemarkie burn mouth today at low tide at 1230pm (Mary Galloway). Skye and Lochalsh: First-winter Iceland Gull in Uig Bay (Neil Bennett). 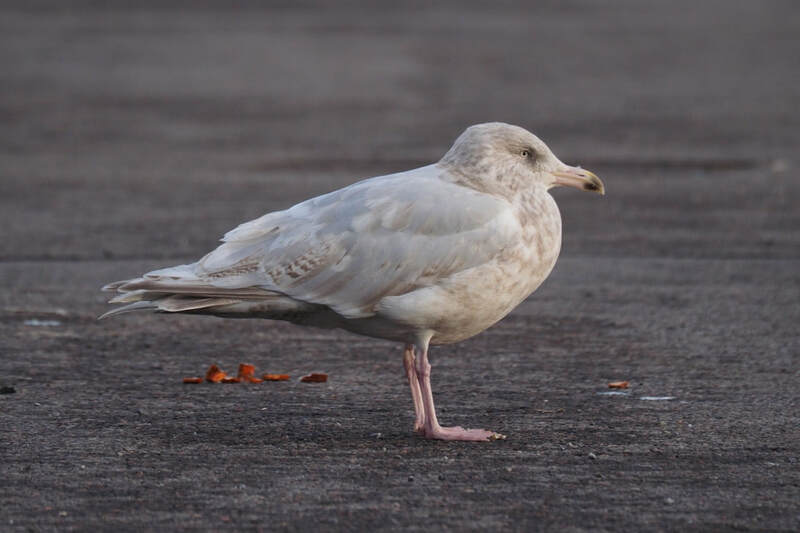 Skye and Lochalsh: First-winter Iceland Gull at Uig bay today (Jonathan Jones). 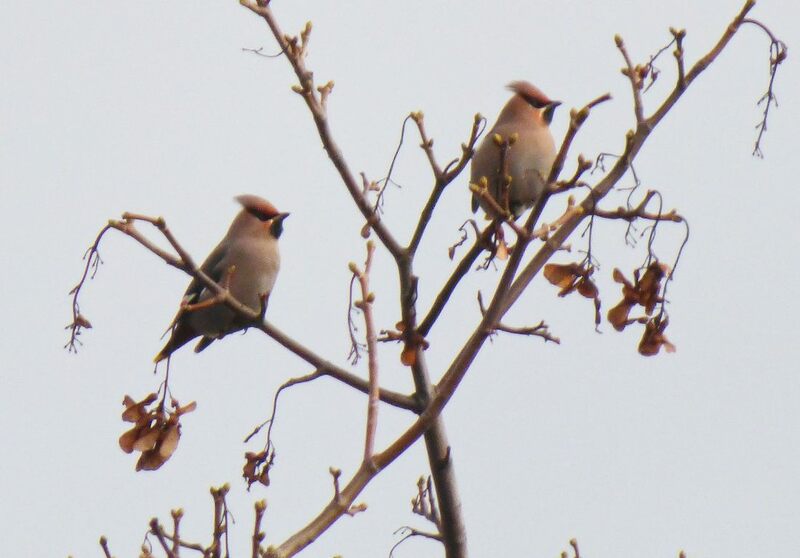 Inverness-shire: 2 Waxwings on Croy village green at 1215pm (Kate Clarke). 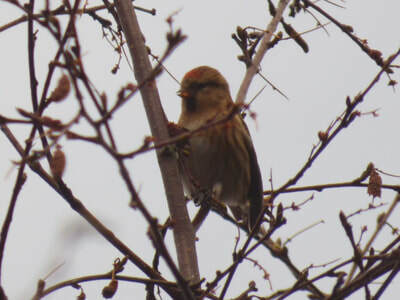 Single Waxwing along Hillhead road towards crow by passing place at Mid Coul Farm (Steve Broyd). 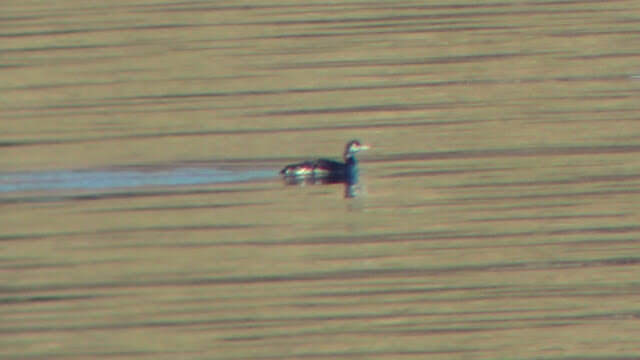 Drake American Wigeon still at Clachnaharry sea loch today. 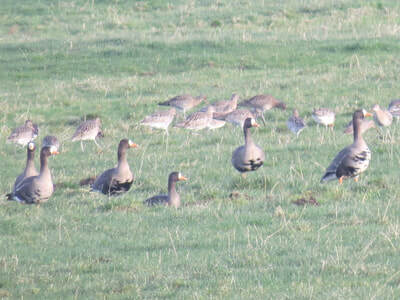 Easter Ross: 10 Greenland White-fronted Geese at Lower Pitkerrie near Loch Eye this morning at NH8680 (Bob Swann). 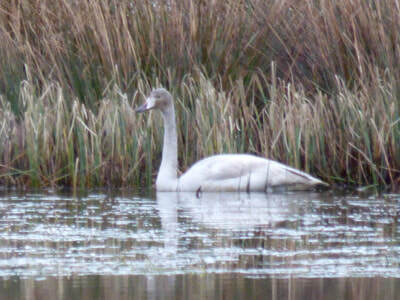 At Tarradale today, 6 Black-tailed Godwits, 2 Greenshanks and 24 Whooper Swans (Lynden Schofield). 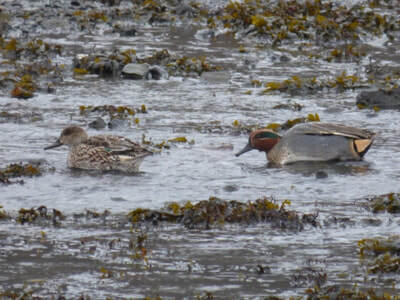 Lochaber: Drake American Wigeon still present at Caol this afternoon (Stu Crutchfield). 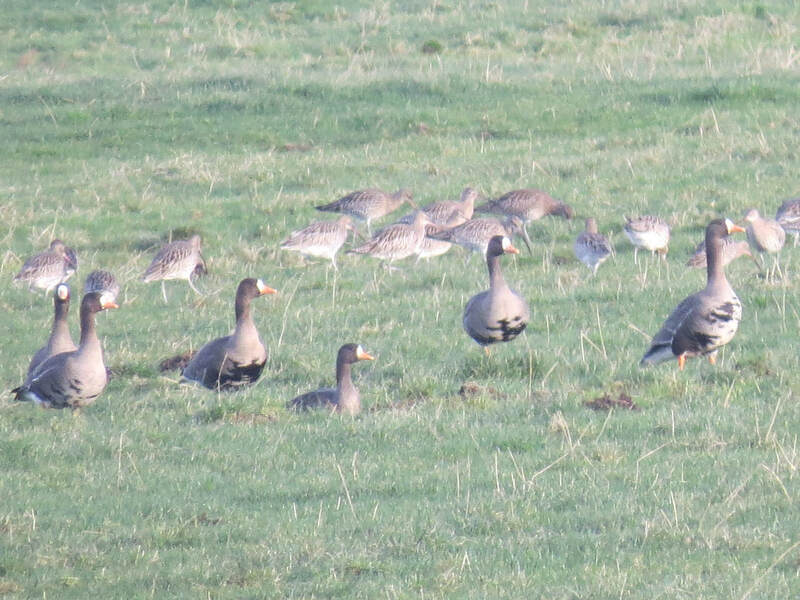 60 Greenland White-fronted Geese at Kentra Moss (Alan Kennedy). 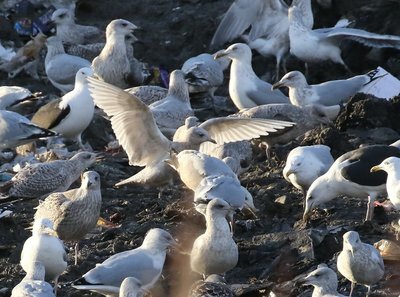 Badenoch and Strathspey: First-winter Iceland Gull at Aviemore tip today (Roger Tozer). Viking Gull at Ullapool (Tessa Rhodes). 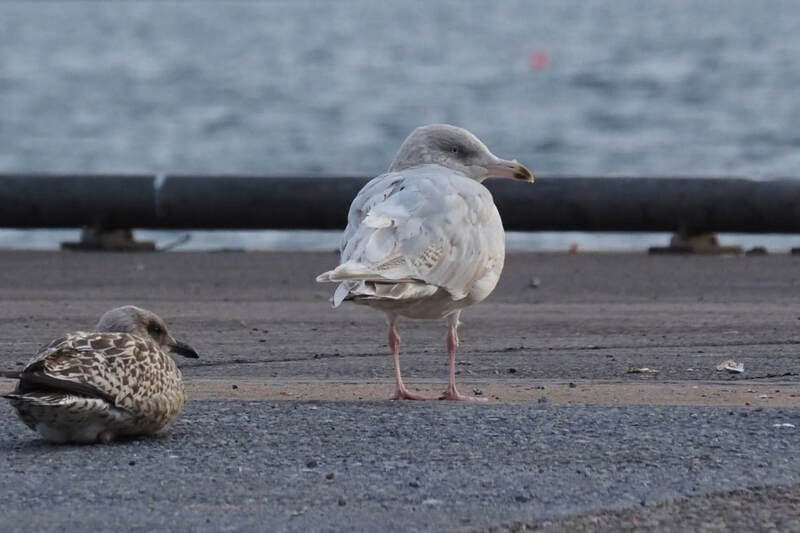 Viking Gull at Ullapool (Tessa Rhodes)..
Greenland White-fronts at Loch Eye (Bob Swann). Easter Ross: A flock of Skylarks, Linnet and at least 50 Snow Bunting in mixed plough and stubble field just East Navity Farm, Black Isle: and 35 Golden Plover just West Navity (Mary Galloway). 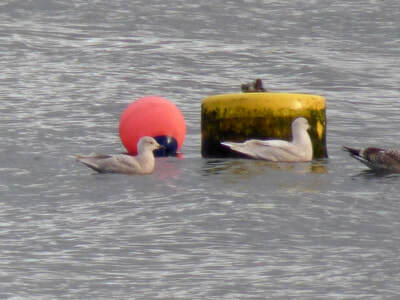 Inverness-shire: Drake American Wigeon was present again today at Clachnaharry between 2.00pm and 2.45pm (at least), this time within the marina at Muirtown Basin, with a small group (7-12) Eurasian Wigeon (Alan Jones). 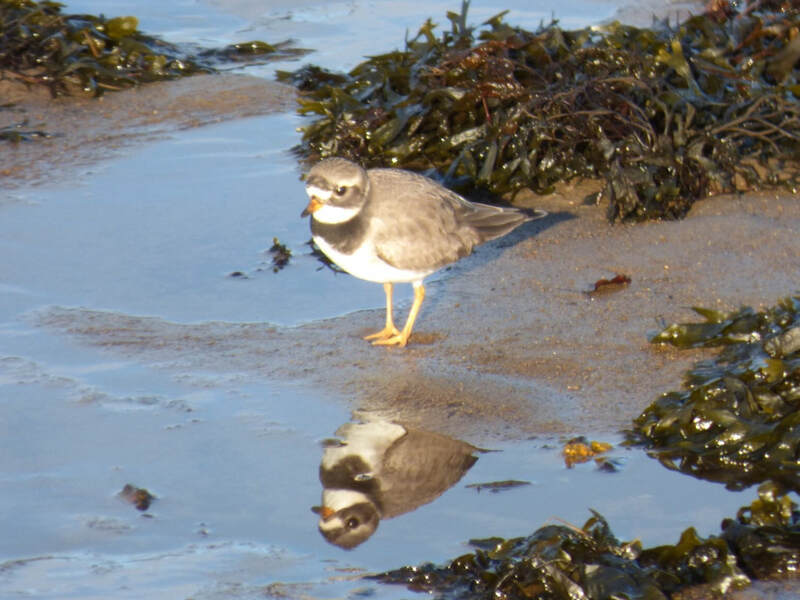 Inverness-shire: Spotted Redshank again at the flood at Easter Dalziel, Castle Stuart at NH761507 (Kate Clarke). 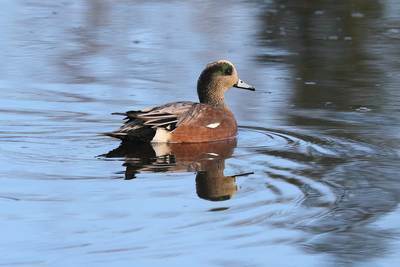 Drake Green-winged Teal and drake Gadwall still present on Loch Flemington (Jon Clarke). Lochaber: Drake American Wigeon showing well by the entrance to the water treatment works at Caol at 1030am, also Iceland Gull flew over (Mike McKee). 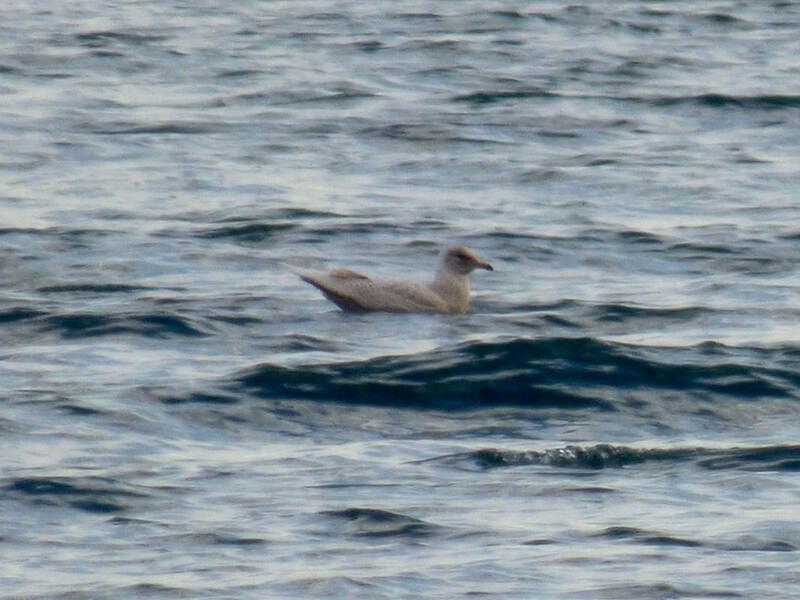 Sutherland: A White-billed Diver flew north past Brora back beach car park today at lunch time, also at least 3 adult and a first-winter Little Gull feeding offshore and 86 Purple Sandpipers (Dean MacAskill). 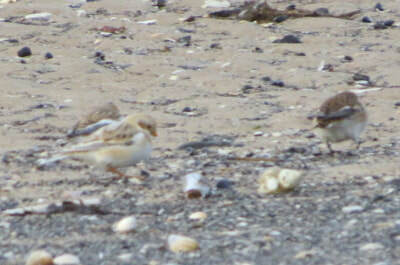 Both Shore Larks still at Loch Fleet in the same location at 2pm (Alistair Matthewson). 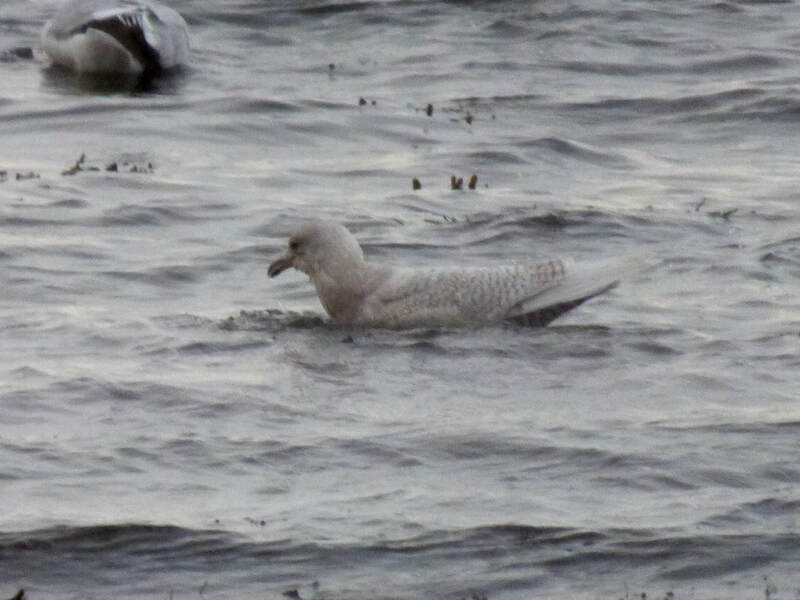 Skye and Lochalsh: First-winter and probably adult Iceland Gull in Uig bay (Jonathan Jones). Teal at Bayfield, Portree (Neil Bennett)..
Jackdaw in Brora (Dean MacAskill). Easter Ross: This morning at high tide the drake American Wigeon was again at Tain Links. 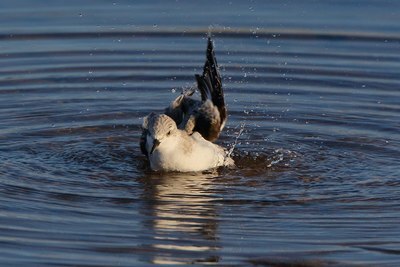 Also 170 Pintail (Simon Levene). 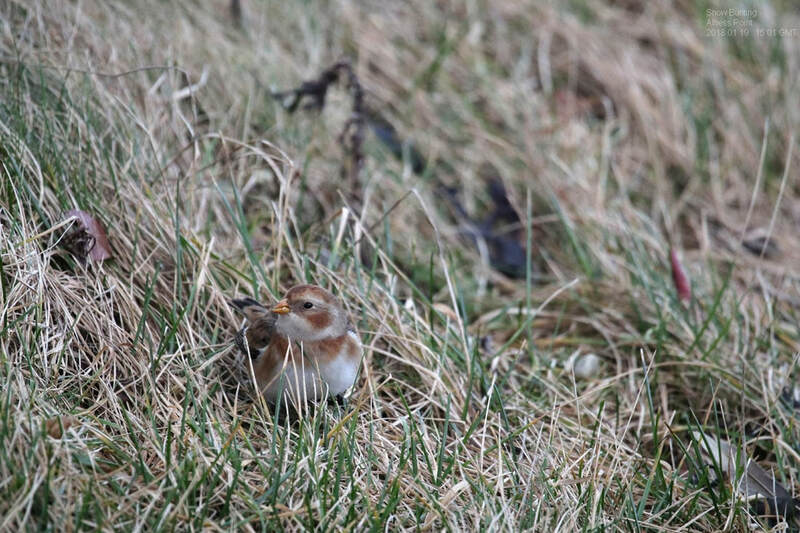 Sutherland: 2 Shore Larks still present in the rain this afternoon with a Skylark at NH809953 (Tom Wells). Skye and Lochalsh: First-winter Glaucous Gull and Iceland Gull at Uig Bay (Neil Bennett). 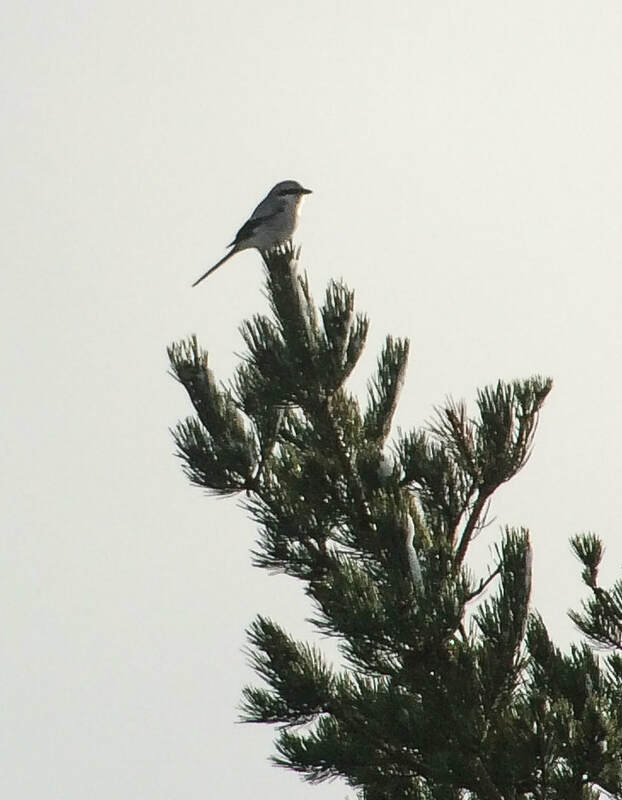 Firecrest reported at Armadale Castle, up the path from the playground next to the stream, heading up to the bridge (P Thorneley). 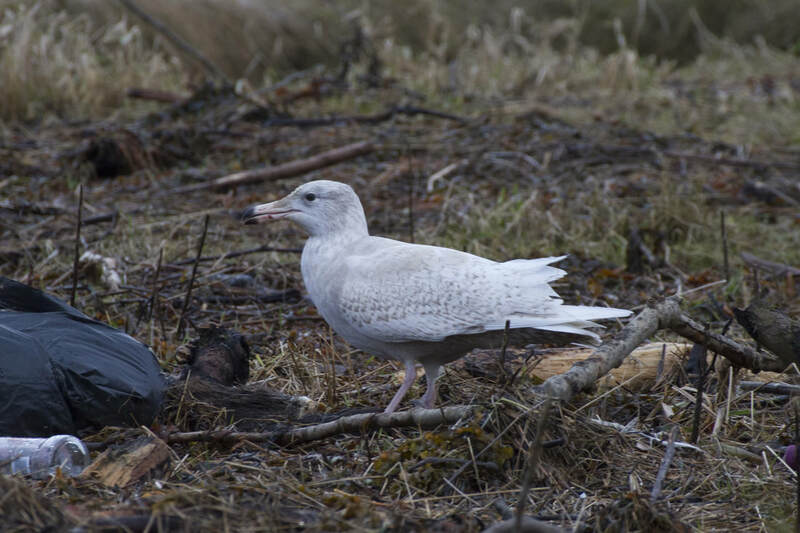 Glaucous Gull at Uig (Neil Bennett). 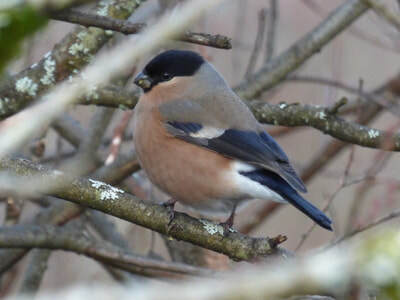 Easter Ross: 5 Waxwings at Saltburn, Invergordon this morning at 1115am at NH726697 (Simon Levene). 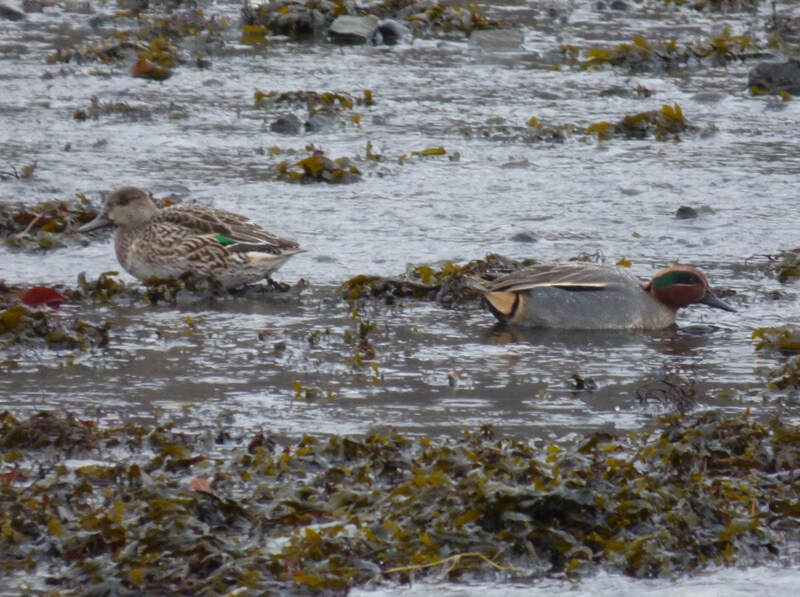 ​Inverness-shire: Drake American Wigeon and female Eurasian Wigeon on the sea lock at Clachnaharry at then flew and landed on the Muirtown Pools at 1120am (Alan Jones/David and Judith Edge). 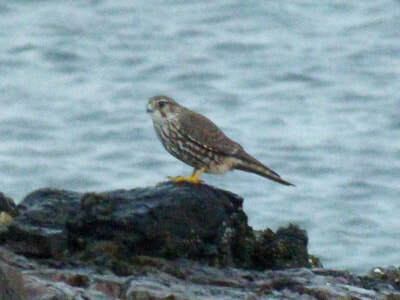 Also Kingfisher flying over the sea between the railway line and the end of the canal at midday. 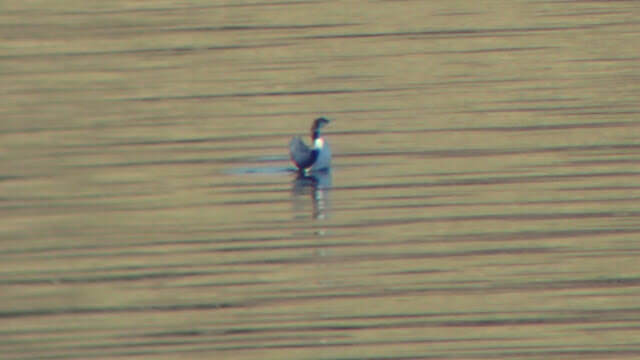 Badenoch and Strathspey: Kingfisher on the Spey at Dalfaber, Aviemore at NH902128 (Pete Gordon). 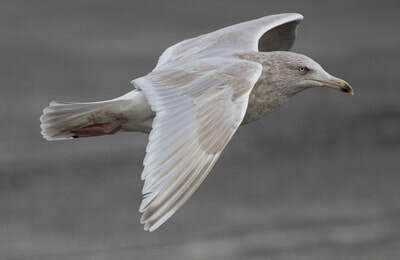 ​Skye and Lochalsh: First-winter Glaucous Gull at Uig, Skye (Seth Gibson). 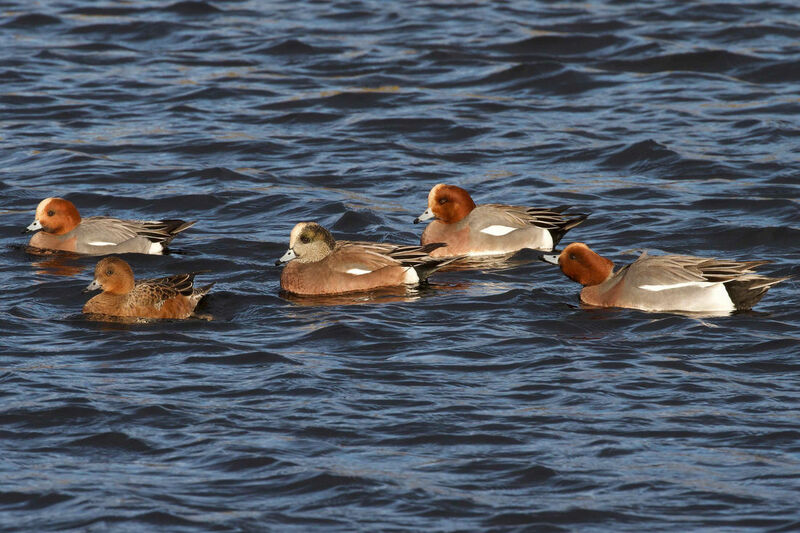 American Wigeon at Clachnaharry (David Edge). American Wigeon at Clachnaharry (David Edge)..
Badenoch and Strathspey: 3CY Iceland Gull at Granish tip, Aviemore (Peter Stronach). 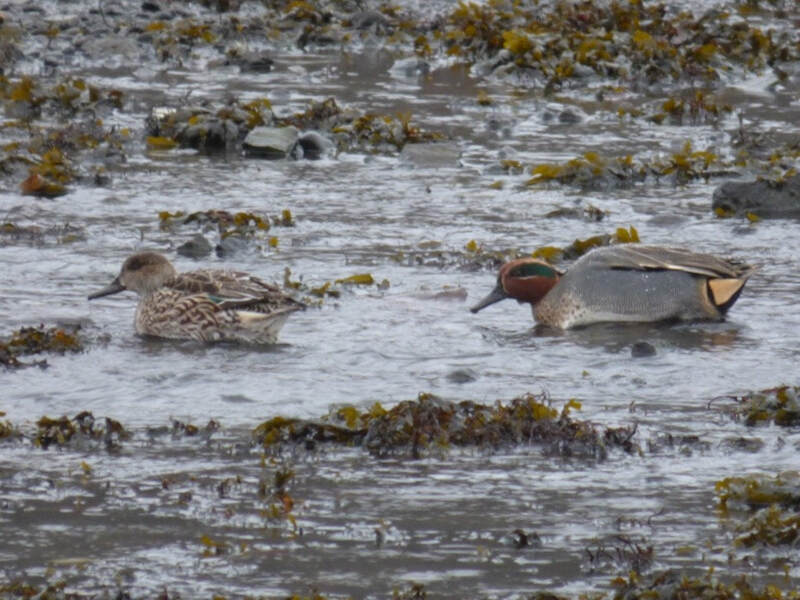 Lochaber: Drake American Wigeon with 23 Wigeon at Caol, Fort William this afternoon at NN102761 then flew towards islands off Corpach (Mike McKee). Easter Ross: Single Waxwing in Alness today (Jimmy Fraser). Wester Ross: Viking Gull at Ullapool in the harbour today (Andy Williams). 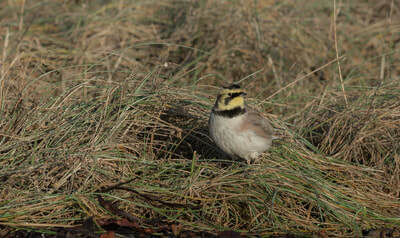 Sutherland: Both Shore Lark still present at Loch Fleet today at 1210pm (Mary Galloway). Inverness-shire: 92 Eider off Fort George this morning and 2 Snow Buntings on the beach (Colin Leslie). 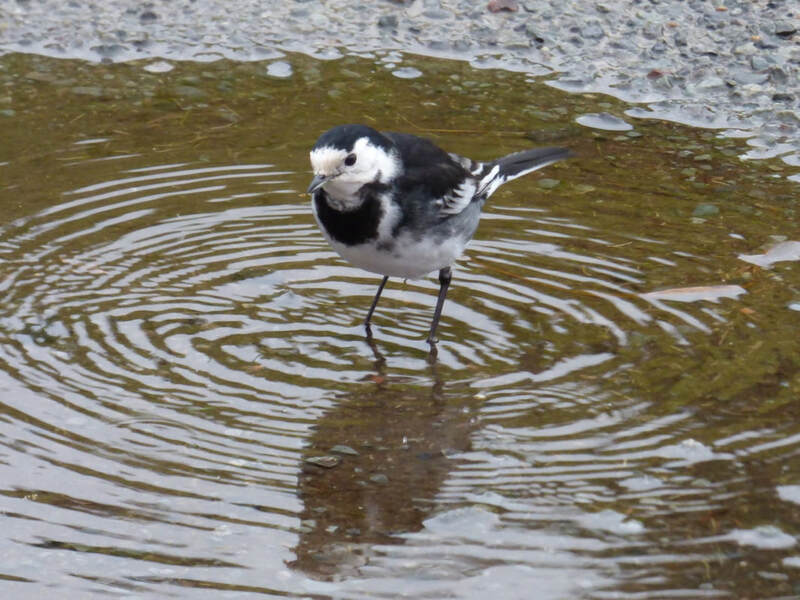 Skye and Lochalsh: Jack Snipe flushed at Portree today (Neil Bennett). 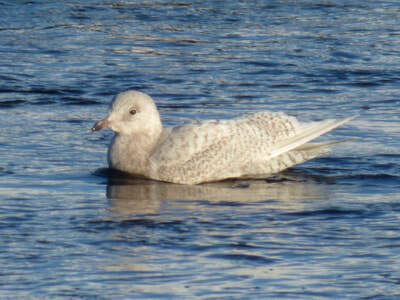 Iceland Gull at Aviemore (Peter Stronach). 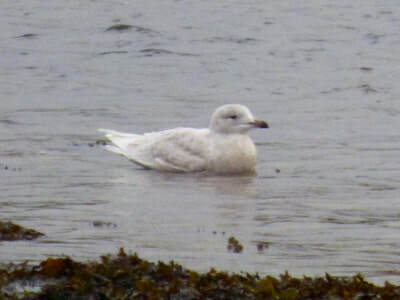 Viking Gull at Ullapool (Andy Williams).. HAPPY NEW YEAR!!! 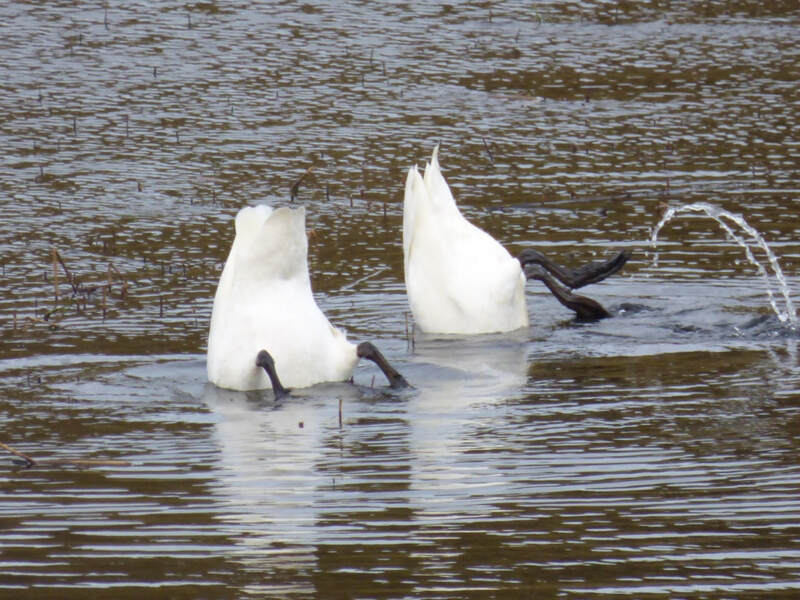 - here's to some good birding in 2018! Inverness-shire: No sign of the drake American Wigeon on the sea lock at Clachnaharry, nor of any Kingfishers at the Muirtown Pools late afternoon (Al McNee). Long-staying Nuthatch still present in a private garden in Invermoriston. Badenoch and Strathspey: Single Waxwing at Causer, Nethy Bridge this afternoon (Pete Gordon). 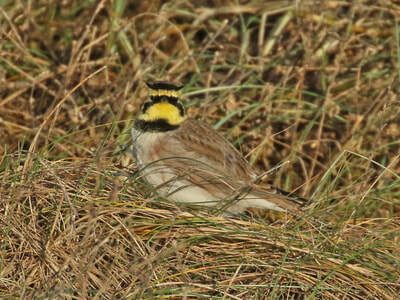 Sutherland: The 2 Shore Larks showed well mid-morning at Coul Links, same general area as before (Al McNee). 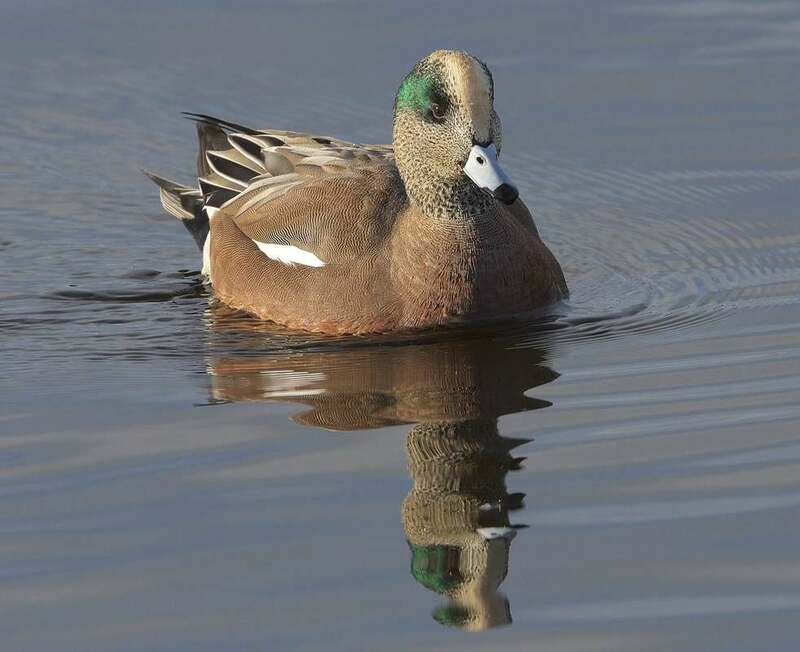 Easter Ross: Drake American Wigeon showing from the hide at Udale bay this morning (Mary Galloway). 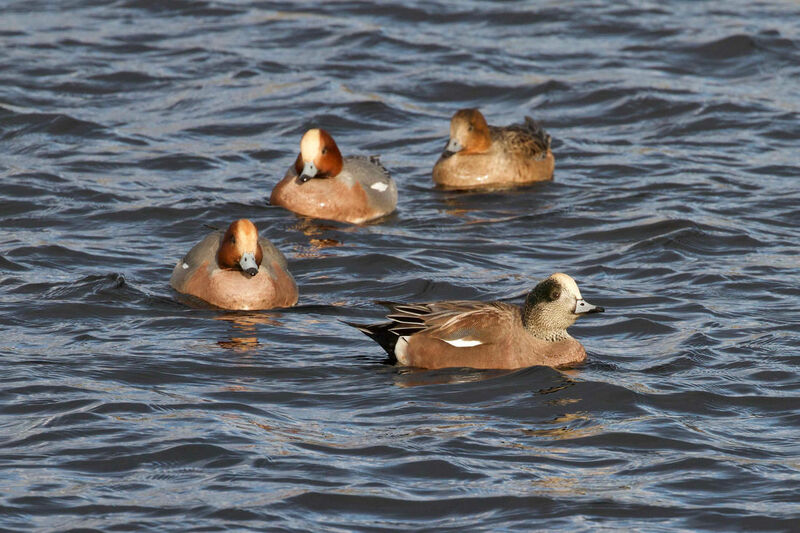 Drake American Wigeon at Tain river mouth at high tide, also 160 Pintail, 12 Shoveler and 430 Teal offshore (Bob Swann). Wester Ross: 13 Woodcock flushed from roadside on a 15 mile drive Fearnmore to Applecross (Nigel Voaden). 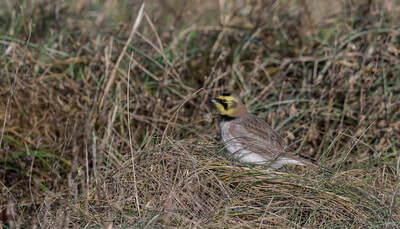 Shore Lark at Loch Fleet (Keith Barnes). 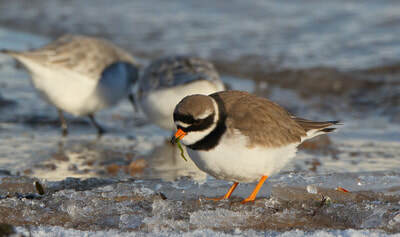 Shore Larks at Loch Fleet (David Main). 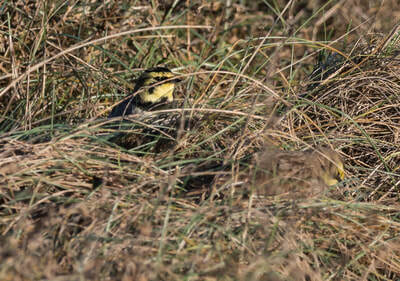 Shore Larks at Loch Fleet (David Main)..